Last day for this exhibition from one of the masters of photography. Apologies to the gallery and the readers that I did not get the posting up earlier but I have just been so busy at work. At least we have a record of the exhibition online. Some of the media images were in a really shocking state. 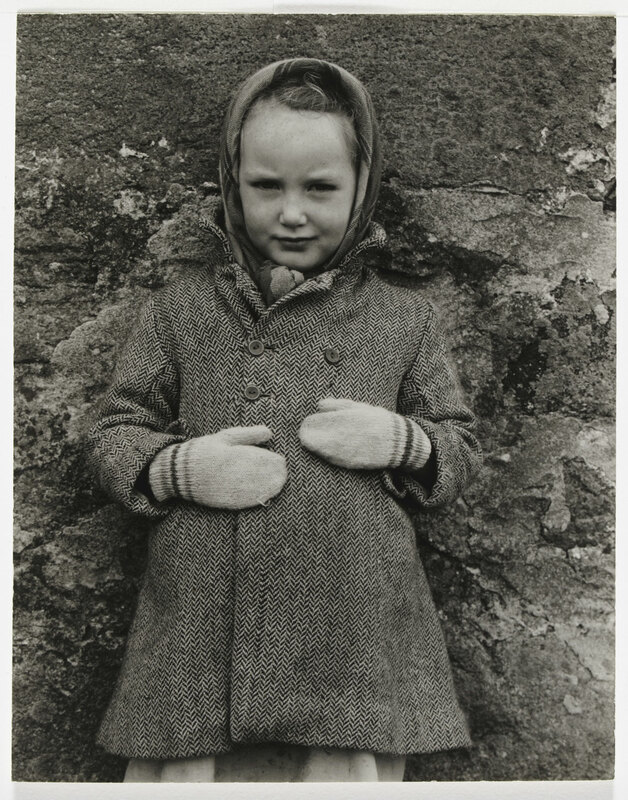 I can’t believe that an artist of Paul Strand’s standing would ever have wanted his photographs distributed in such a state – for example, enlarge the unrestored Milly, John and Jean MacLellan, South Uist, Hebrides (1954, detail) below, and then look at the restored version above that I have digitally cleaned. What can you say about Strand that has not already been said before? 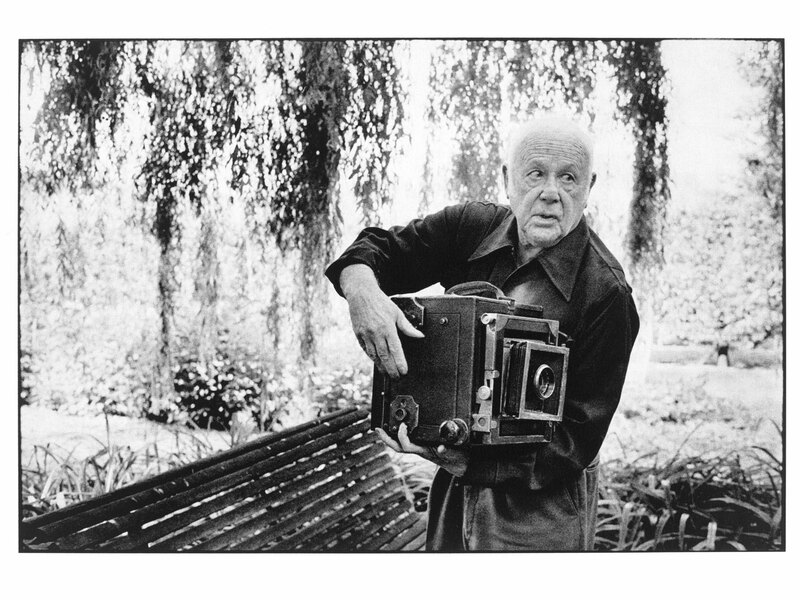 He is a seminal figure in the history of photography. His Wall Street, New York (1915, below) is still one of my favourite images of all time – for its light, foreboding, and insicisve comment on capitalism and the worker. 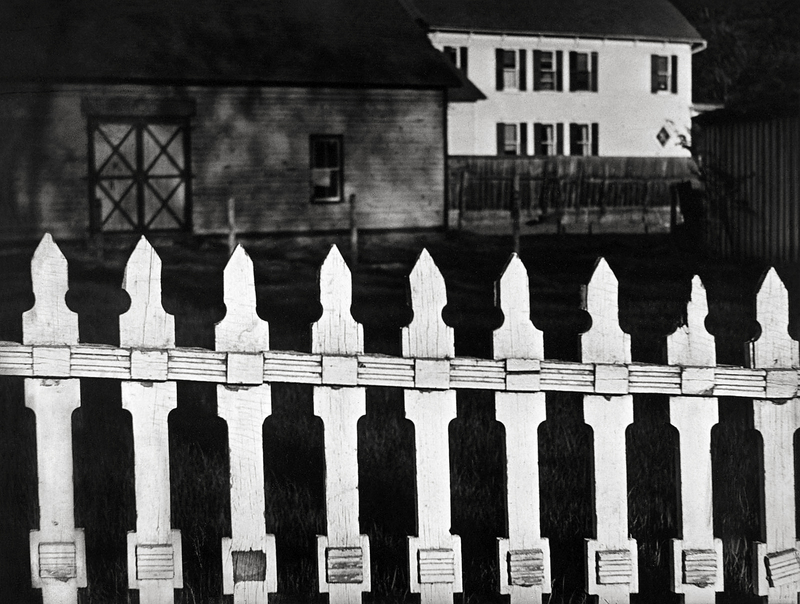 Follow this by one of the first truly “modernist” images, and one that changed the course of photography (and what a difference a year, and an image makes), White Fence, Port Kent, New York (1916, below) and you set the scene for a stellar career. To have that natural perspicaciousness: a penetrating discernment – a clarity of vision or intellect which provides a deep understanding and insight – is an element of wisdom that cannot be taught. As an artist, you’ve either got it or you haven’t. Oportet ingenii aciem ad res minimas et maxime faciles totam convertere, atque in illis diutius immorari, donec assuescamus veritatem distincte et perspicue intueri. Intuiting the truth distinctly and perspicuously… quick to pick out, from among the thousands of things he sees, those that are significant, and to synthesize observations. This is what Strand does so well. His photographs are honest, direct, without ego. They just are. They live and breathe the subject. 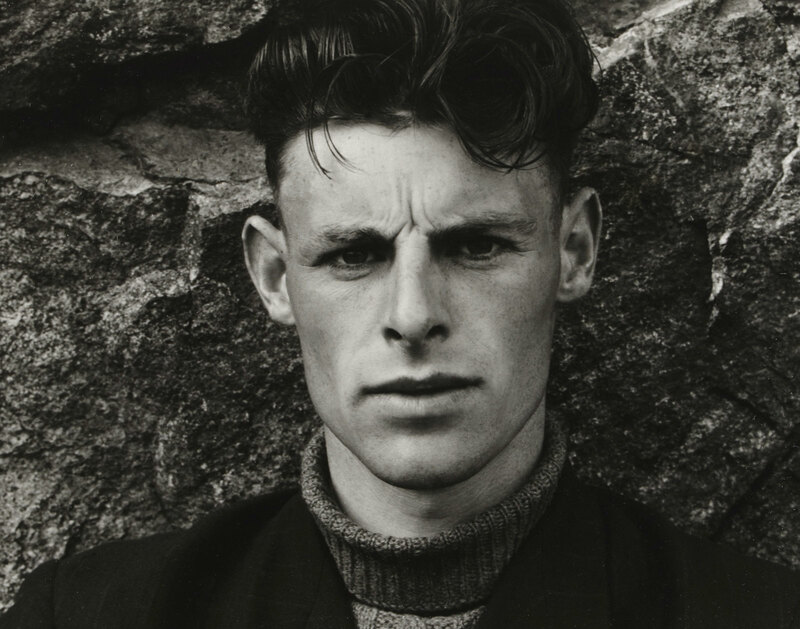 How do you get that look, that presence such as in Young Boy, Gondeville, Charente, France (1951, below). 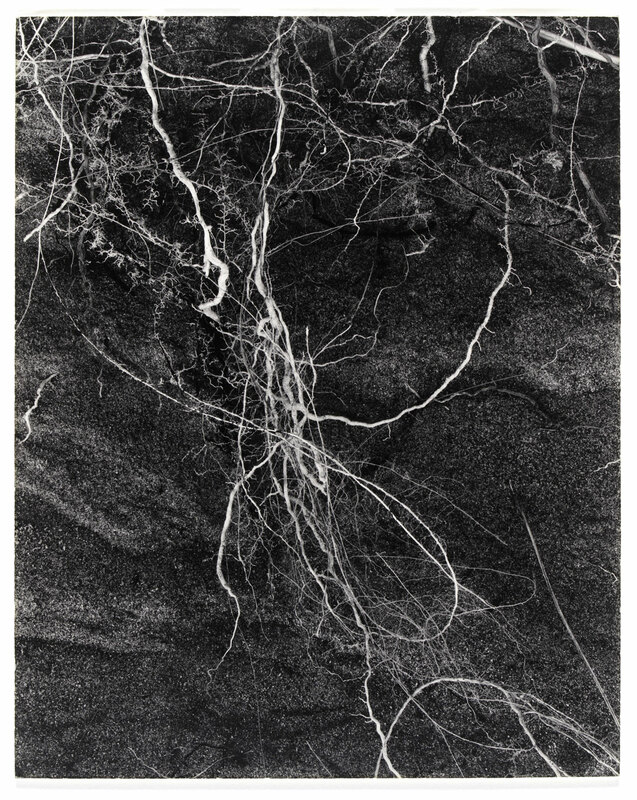 That presence is repeated again and again – in rocks, tendrils, people, buildings, landscapes – and finally, in the last years of his life, in intimate, sensitive and complex images of his garden at Orgeval. 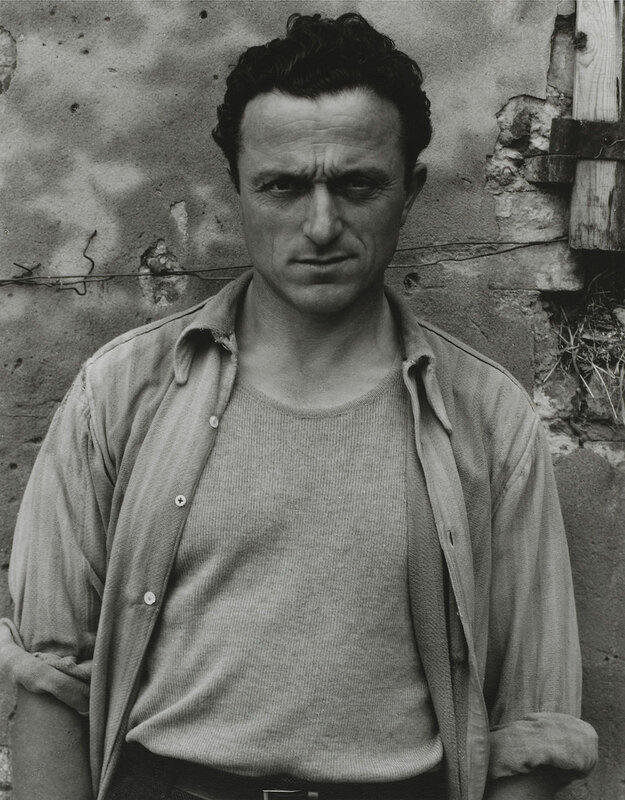 God bless that we have great artists like Paul Strand. 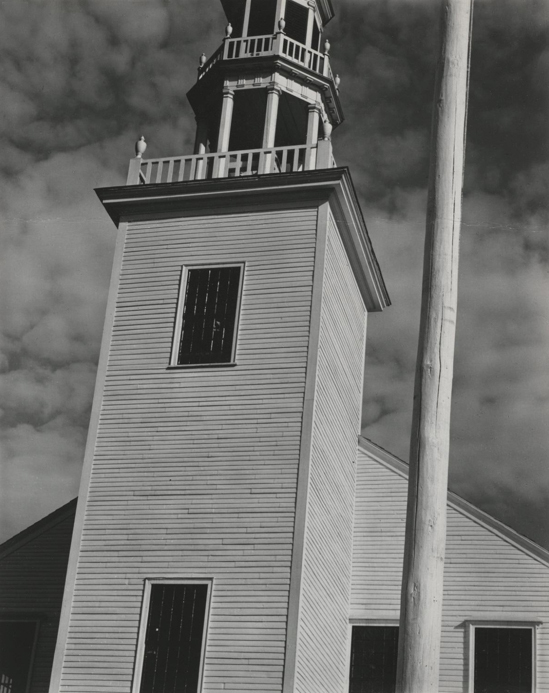 “For the first time in the UK in 40 years a major retrospective on the American photographer Paul Strand (1890-1976) opens at the V&A. The exhibition is the first of its kind since Strand’s death in 1976 and shows how the pioneering photographer defined the way fine art and documentary photography is understood and practiced today. The exhibition begins in Strand’s native New York in the 1910s, exploring his early works of its financial district, railyards, wharves and factories. 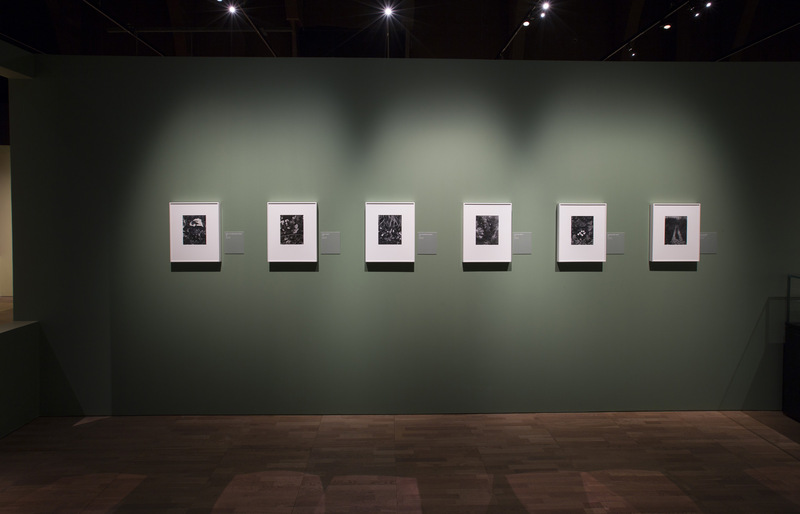 During this time he broke with the soft-focus and Impressionist-inspired ‘Pictorialist’ style of photography to produce among the first abstract pictures made with a camera. 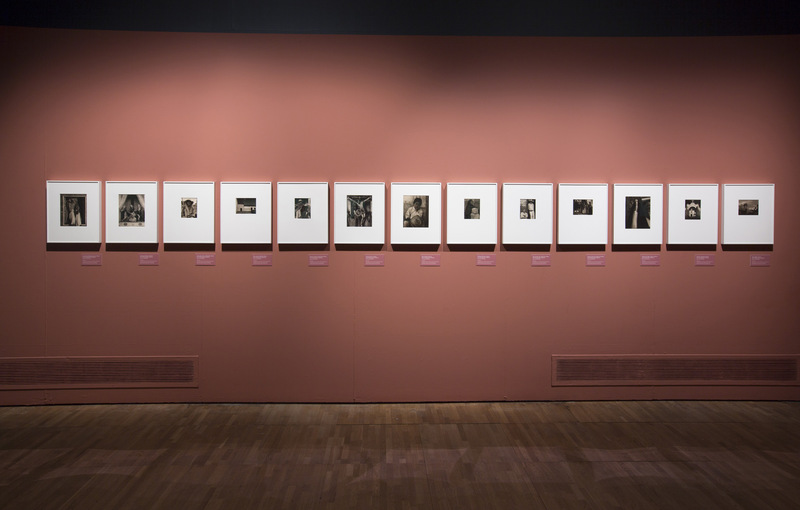 The influence of photographic contemporaries Alfred Stieglitz and Alvin Langdon Coburn as well European modern artists such as Braque and Picasso can be seen in Strand’s experiments in this period. On display are early masterpieces such as Wall Street which depicts the anonymity of individuals on their way to work set against the towering architectural geometry and implied economic forces of the modern city. 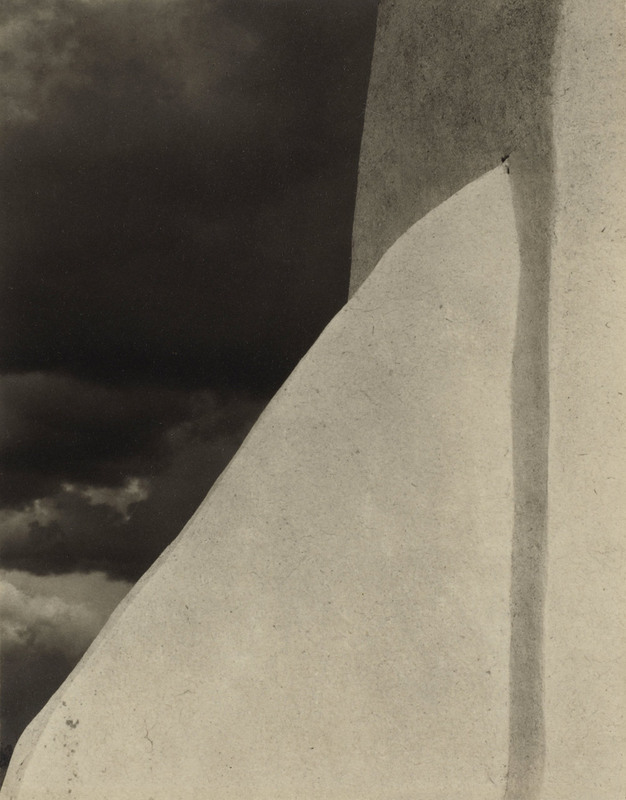 Strand’s early experiments in abstraction, Abstraction, Porch Shadows and White Fence are also shown, alongside candid and anonymous street portraits, such as Blind Woman, made secretly using a camera with a decoy lens. 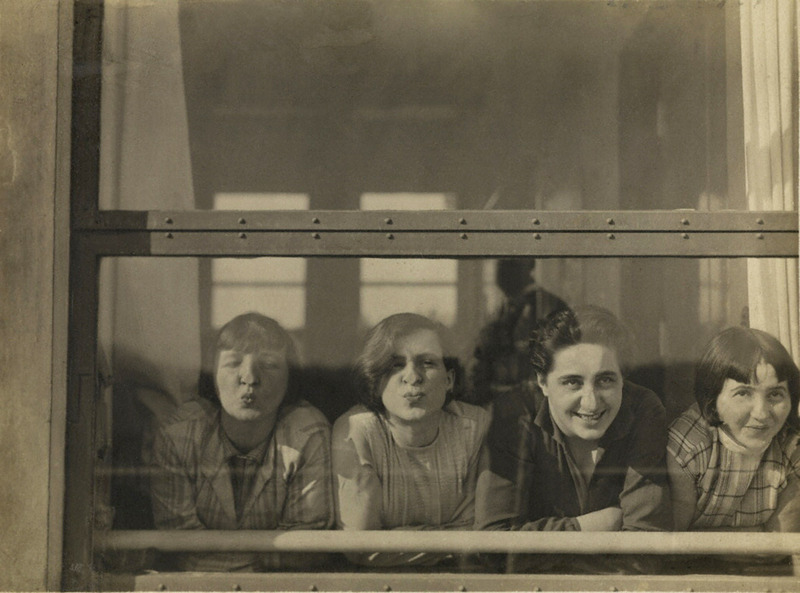 The exhibition explores Strand’s experiments with the moving image with the film Manhatta (1920 – 21). A collaboration with the painter and photographer Charles Sheeler, Manhatta was hailed as the first avant-garde film, and traces a day in the life of New York from sunrise to sunset punctuated by lines of Walt Whitman’s poetry. 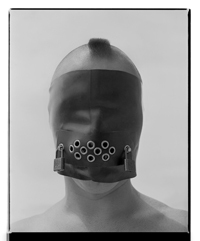 Strand’s embrace of the machine and human form is a key focus of the exhibition. In 1922, he bought an Akeley movie camera. The close-up studies he made of both his first wife Rebecca Salsbury and the Akeley during this time are shown alongside the camera itself. Extracts of Strand’s later, more politicised films, such as Redes (The Wave), made in cooperation with the Mexican government are featured, as well as the scarcely-shown documentary Native Land, a controversial film exposing the violations of America’s workforce. 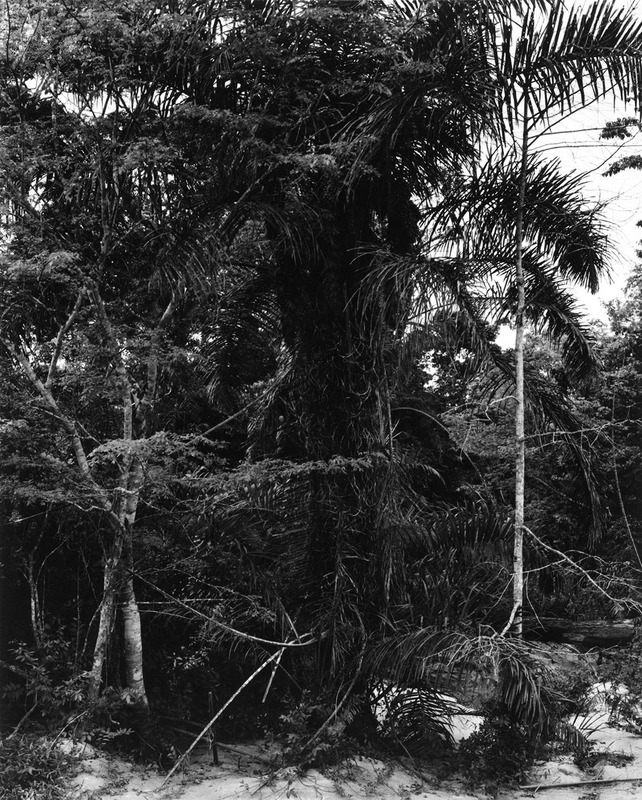 Strand travelled extensively and the exhibition emphasises his international output from the 1930s to the late 1960s, during which time he collaborated with leading writers to publish a series of photobooks. 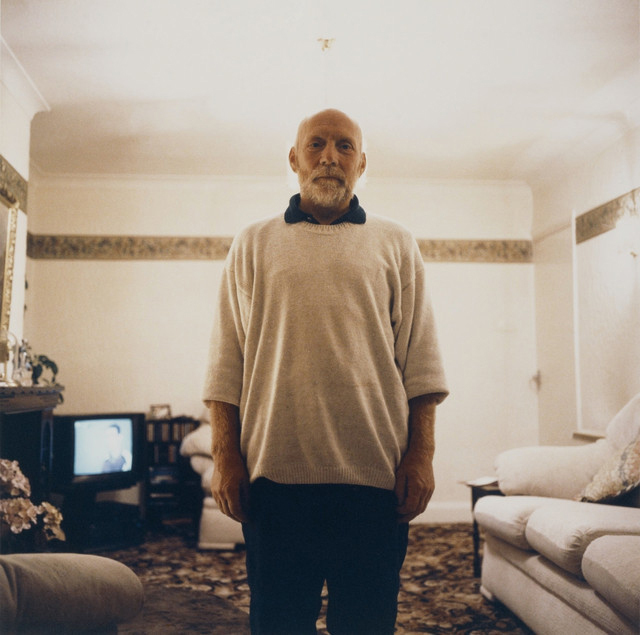 As Strand’s career progressed, his work became increasingly politicised and focused on a type of social documentary alongside the desire to depict a shared humanity. 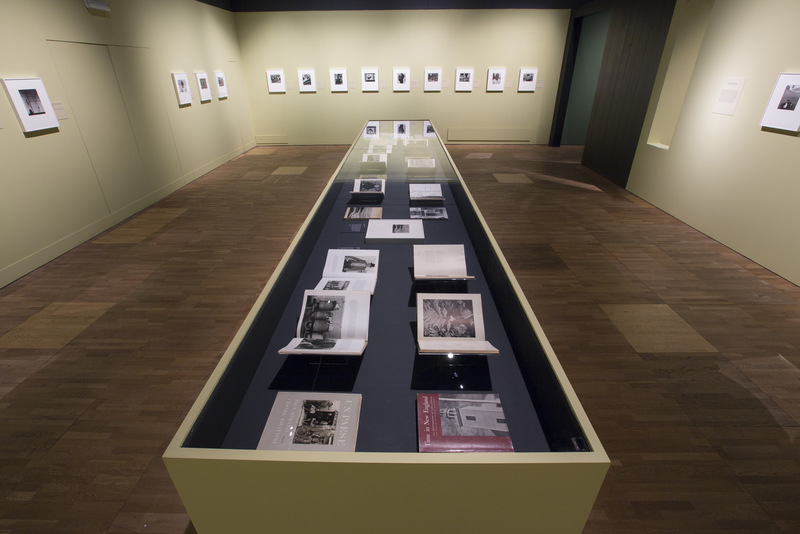 The exhibition features Strand’s first photobook Time in New England (1950), alongside others including a homage to his adopted home France and his photographic hero Eugène Atget, La France de profil, which he made in collaboration with the French poet, Claude Roy. 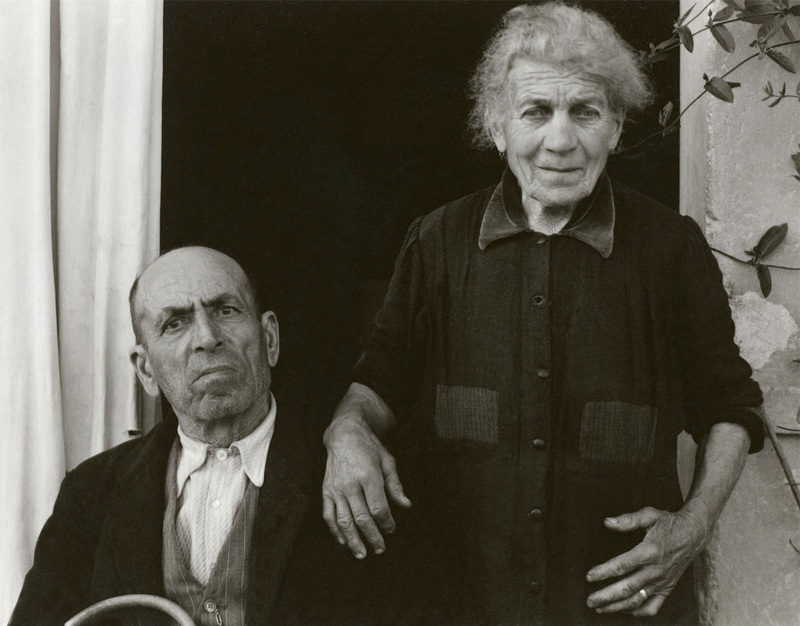 One of Strand’s most celebrated images, The Family, Luzzara, (The Lusetti’s) was taken in a modest agricultural village in Italy’s Po River valley for the photobook Un Paese, for which he collaborated with the Neo-Realist screen writer, Cesare Zavattini. On display, this hauntingly direct photograph depicts a strong matriarch flanked by her brood of five sons, all living with the aftermath of the Second World War. 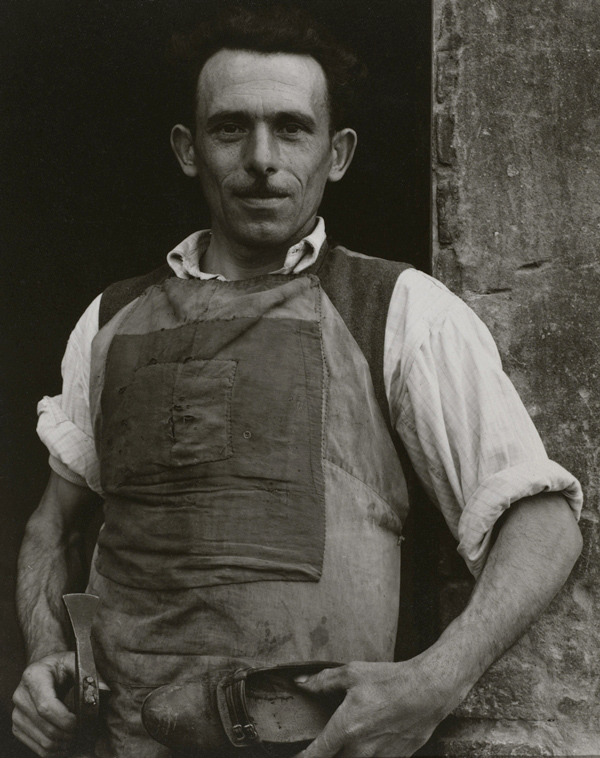 “Ahead of the first UK retrospective on Paul Strand in over 40 years, the V&A has acquired nine rare photographs from the pioneering 20th century photographer’s only UK-based series. 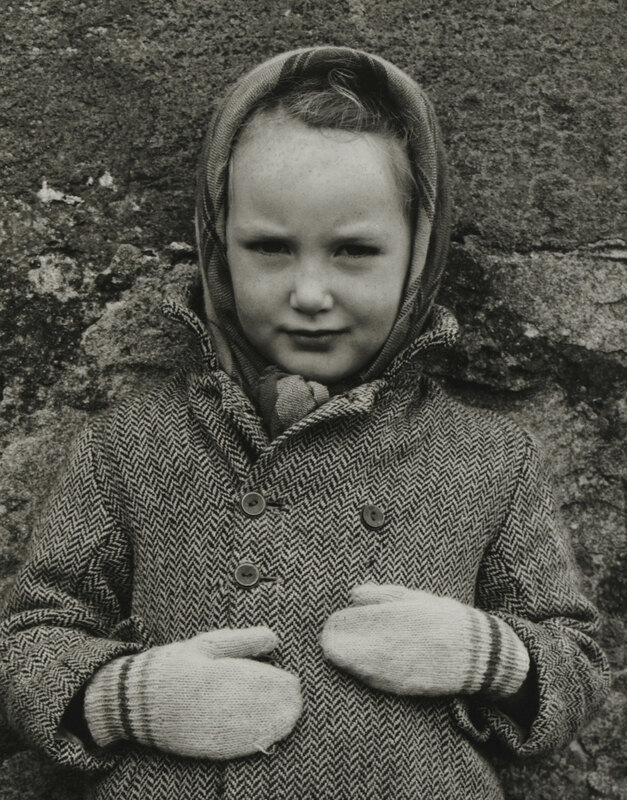 Taken in 1954 in the Outer Hebrides in Scotland, the photographs document the threat to traditional Gaelic life during the Cold War. 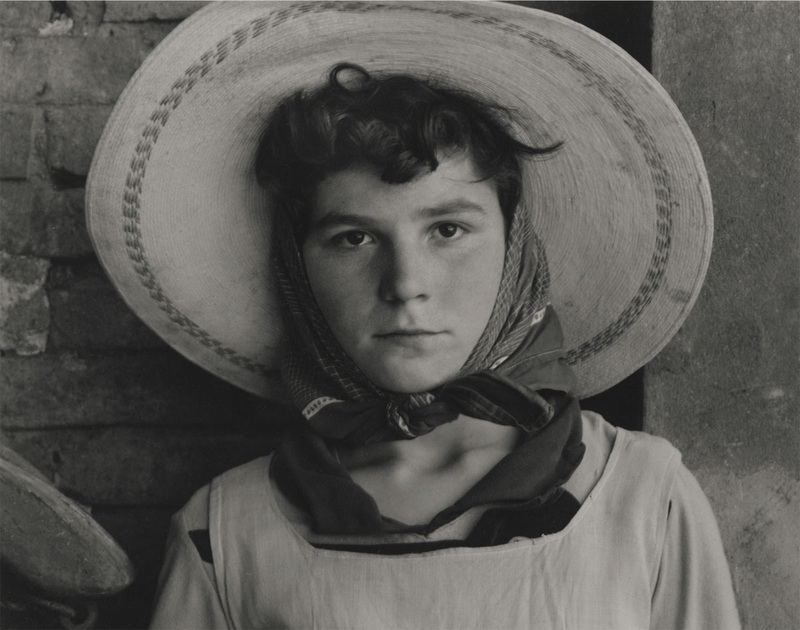 The photographs will be unveiled for the first time together as part of the exhibition, Paul Strand: Photography and Film for the 20th Century, opening 19 March. 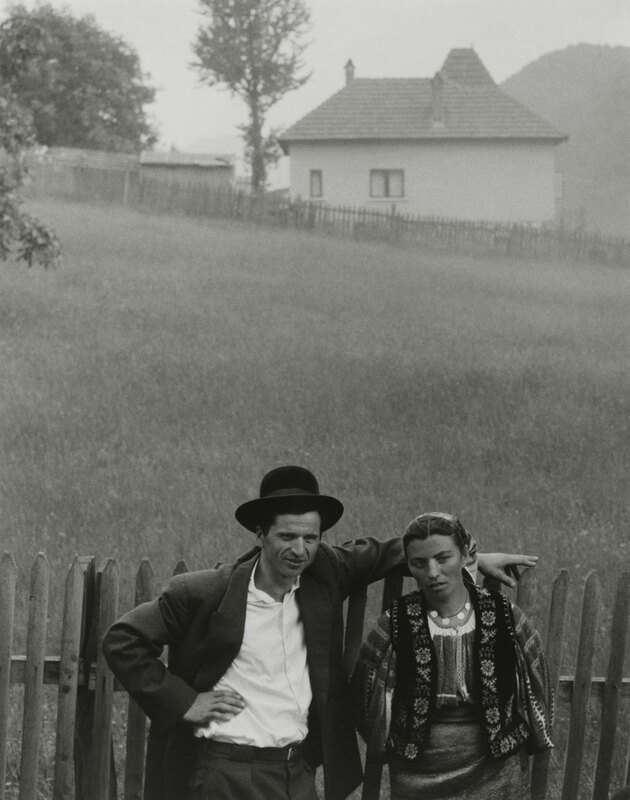 Paul Strand defined the way fine art and documentary photography is understood and practiced today through his revolutionary experiments with the medium. 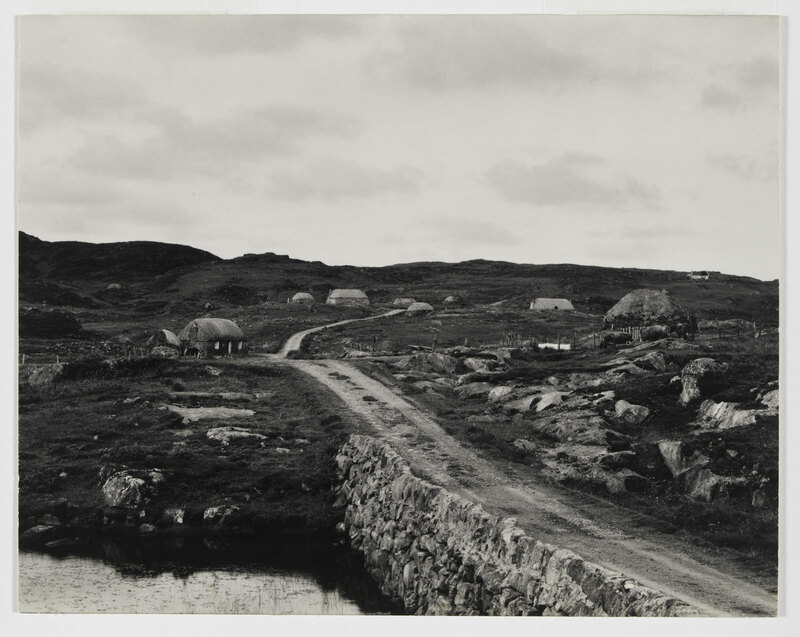 The major acquisition, purchased for the V&A with the assistance of its Photographs Acquisition Group, comprise an intimate set of nine exquisite black and white vintage prints originally made for Strand’s photobook Tir A’Mhurain (‘Land of Bent Grass’). A committed Marxist, Strand fled McCarthyism in the U.S. in 1950, pursued by the FBI. He settled in France, and carried out work there and in Italy before arriving on the Hebridean island of South Uist in 1954. Inspired by a BBC radio programme on Gaelic song, and news that the island would become home to a testing range for America’s new nuclear missile, Strand raced to capture the sights, sounds and textures of the place steeped in the threatened traditions of Gaelic language, fishing and agricultural life of pre-Industrial times. The photographs reveal Strand’s meticulous and methodical approach to photography, much like a studio photographer in the open air. They capture not only a pivotal moment in time, but also the end of a particular way of life for the islanders. 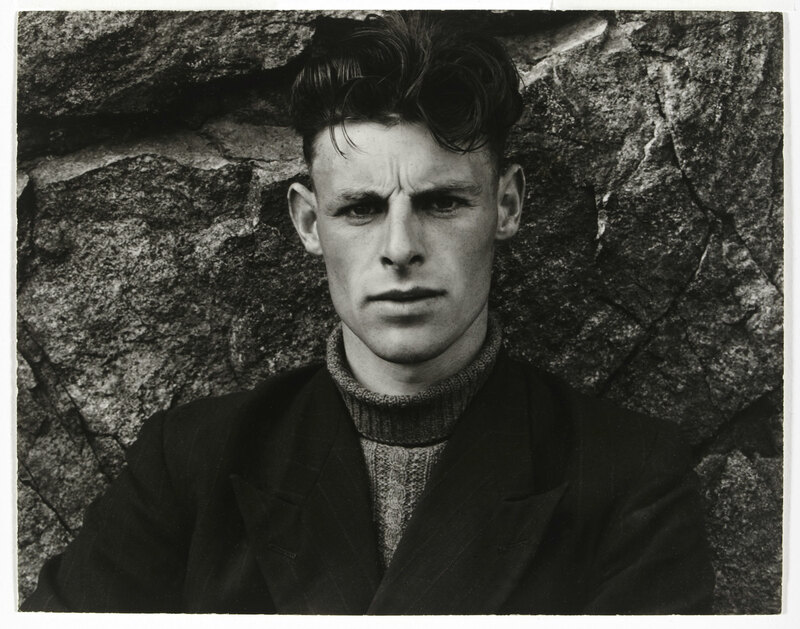 The acquisition encompasses four portraits of islanders staring directly at the camera, exuding strength and dignity. Each was photographed in their own environment, usually in or around their home, and is framed by weathered walls, doors or window frames – devices used often by Strand and borrowed from his 19th century photographic heroes David Octavius Hill and Robert Adamson. 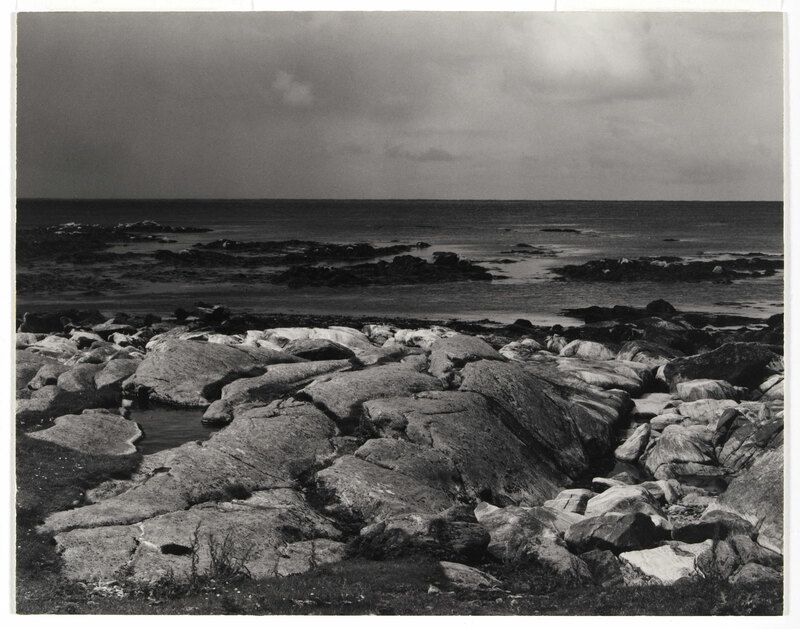 The V&A has also acquired five of Strand’s evocative landscapes, revealing the island’s reliance on the land and sea. “Great camera – very great photographer. From a personal perspective, in my first year at university learning the history of the medium in the early 1990s, the image White Fence, Port Kent, New York (1916, below) was proposed as the first truly modernist photograph. I remember seeing this image for the first time, placing myself in that time (the First World War) and trying to understand what a shock that photograph must have been to the world of Pictorialism. Even now, the strength of that white picket fence is electrifying in its frontality and geometric solidity. In this image, “Strand deliberately destroyed perspective to build a powerful composition from tonal planes and rhythmic pattern.”1 A year earlier Strand had produced what is one of my favourite photographs of all time, a modernist image – Wall Street, New York (1915, below), with the dark maw of industry ready to swallow the rushing workers framed in streaming sunlight. We cannot underestimate the impact that Strand’s revolutionary photographs had on the history of photography. You only have to look at the images. 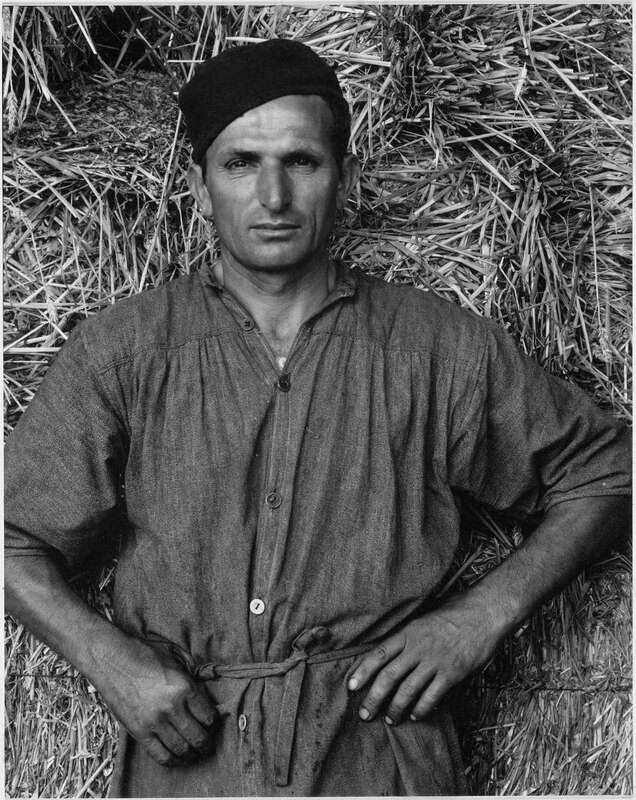 Look at the tonality and intense stare in Young Boy, Gondeville, Charente, France (1951, below), so haunting and beautiful. Observe the ensemble of figures so tightly choreographed in The Family, Luzzara (The Lusettis) (1953, below) or the darkness and weight of the cheese in Parmesan, Luzzara (1953, below) – an image I had never seen before – as it presses into the upturned hand. Magnificent. What seems so difficult to others and what is difficult in reality, is expressed simply and eloquently by Strand, whether it be portraits of tribal elders, market squares or oil refineries. That is the mark of a master craftsman, when the difficult appears simple and insightful at one and the same time. I vividly recall seeing a folio from The garden series (1957-67, printed in the year of his death 1976) – still lifes of his garden in Orgeval, outside Paris – at the National Gallery of Victoria and being awestruck by their tonality, their beauty, quietness and lyricism. No ego here… just a reflection of life on earth and “the beauty of myriad textures.” Several of these photographs are at the bottom of the posting. An aphorism that I was taught when first starting out as a photographer was that Strand said it took ten years to become a photographer. Ten years of study to understand your equipment, your medium and what you are trying to say yourself as an artist – and to get rid of ego in the work, to let the work just speak for itself. Whether he actually said this I am not sure, but from my experience I would say that it is about right. Strand starting studying photography at the Ethical Culture School in 1907 under the tutelage of documentary photographer Lewis Hine and his first important images were produced in 1915. The timeline is there. 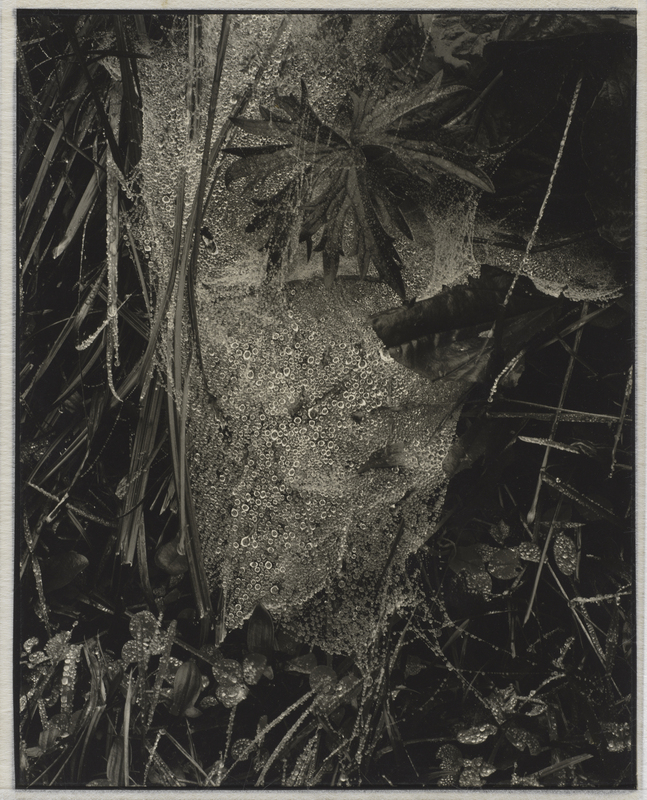 For Strand, “the camera was a machine – a modern machine,” says curator of the exhibition Peter Barberie. “He was preoccupied with the question of how modern art – whether it’s photography or not – could contain all of the humanity that you see in the western artistic traditions.” A big ask but a great artist to do it. 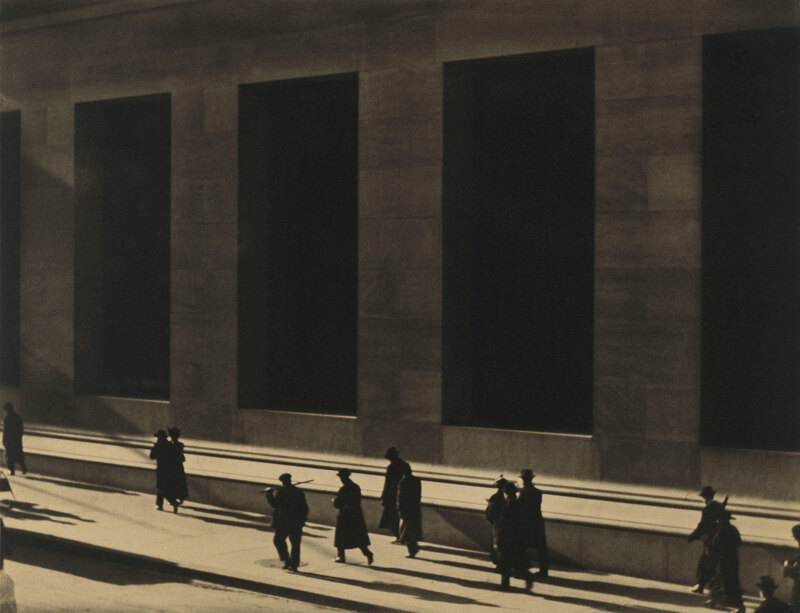 Paul Strand’s 1915 photograph of Wall Street workers passing in front of the monolithic Morgan Trust Company can be seen as the quintessential representation of the uneasy relationship between early twentieth-century Americans and their new cities. Here the people are seen not as individuals but as abstract silhouettes trailing long shadows down the chasms of commerce. 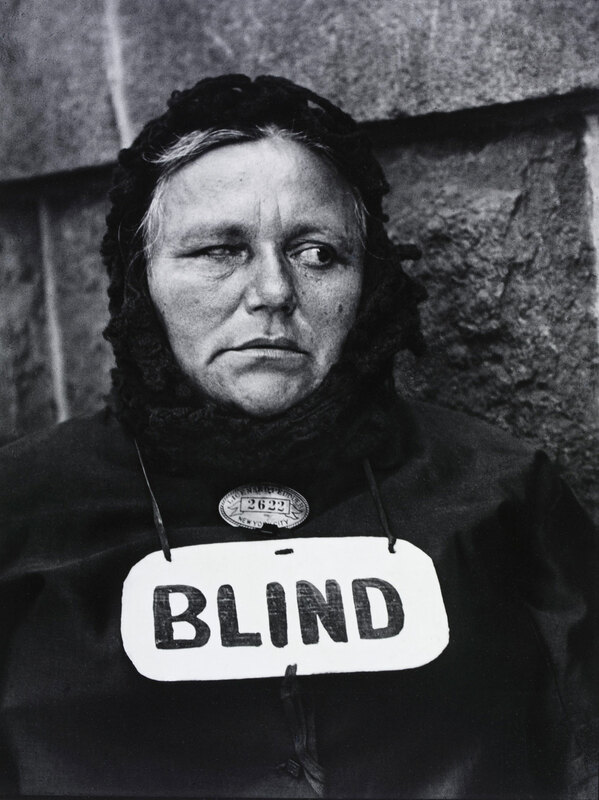 The intuitive empathy that Strand demonstrates for these workers of New York’s financial district would be evident throughout the wide and varied career of this seminal American photographer and filmmaker, who increasingly became involved with the hardships of working people around the world. 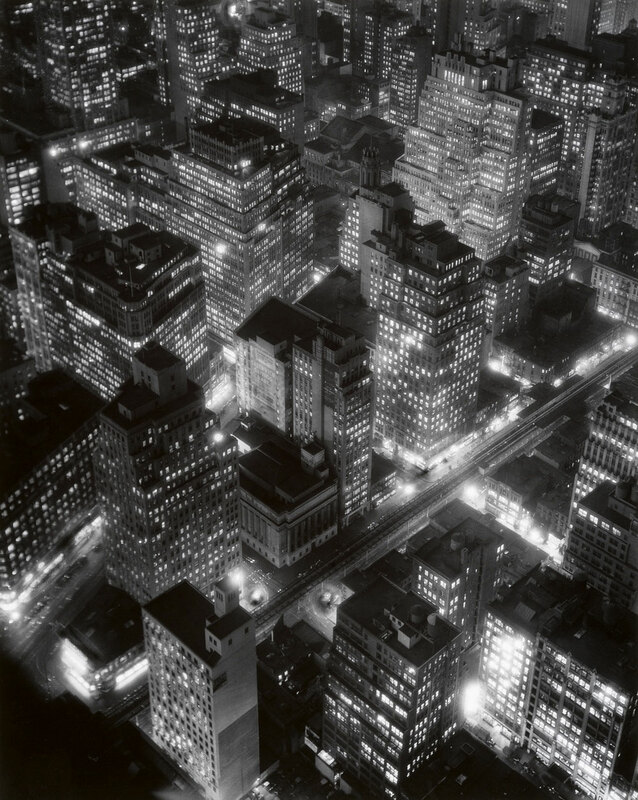 In this and his other early photographs of New York, Strand helped set a trend toward pure photography of subject and away from the pictorialist” imitation of painting.Wall Street is one of only two known vintage platinum prints of this image and one of the treasures of some five hundred photographs in the Museum’s Paul Strand Retrospective Collection. Martha Chahroudi, from Philadelphia Museum of Art: Handbook of the Collections (1995), p. 230. 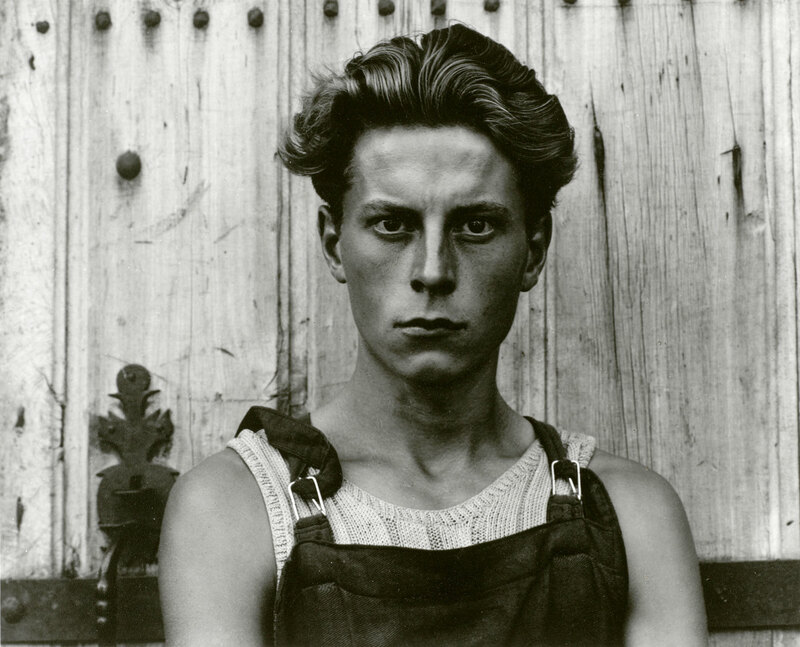 “The Philadelphia Museum of Art is presenting the first major retrospective in nearly fifty years to be devoted to Paul Strand (American, 1890-1976), one of the greatest photographers in the history of the medium. It explores the remarkable evolution of Strand’s work spanning six decades, from the breakthrough moment when he brought his art to the brink of abstraction to his broader vision of the place of photography in the modern world. 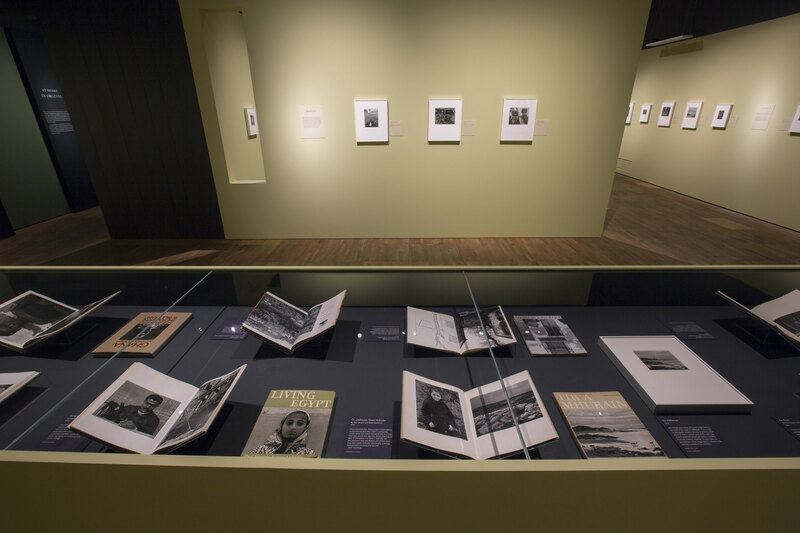 This exhibition examines every aspect of Strand’s work, from his early efforts to establish photography as a major independent art form and his embrace of filmmaking as a powerful medium capable of broad public impact to his masterful extended portraits of people and places that would often take compelling shape in the form of printed books. 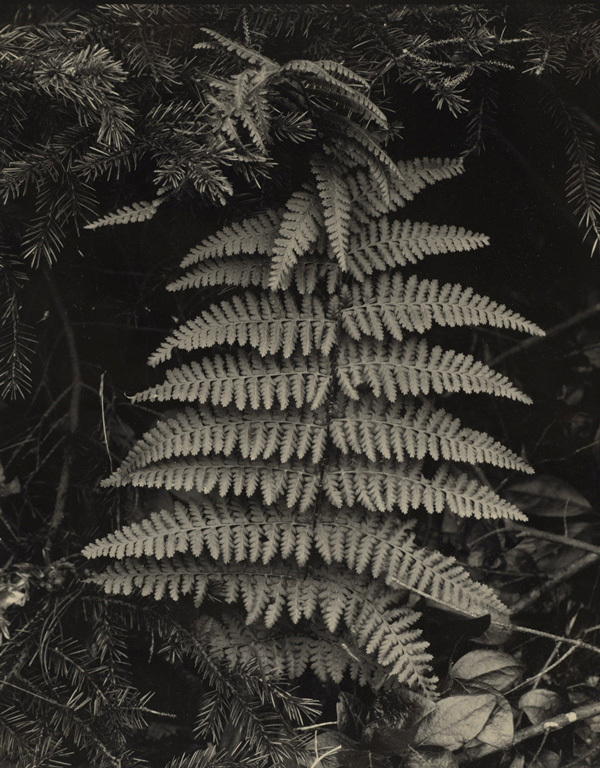 Paul Strand: Master of Modern Photography celebrates the recent acquisition of more than 3,000 prints from the Paul Strand Archive, which has made the Philadelphia Museum of Art the world’s largest and most comprehensive repository of Strand’s work. 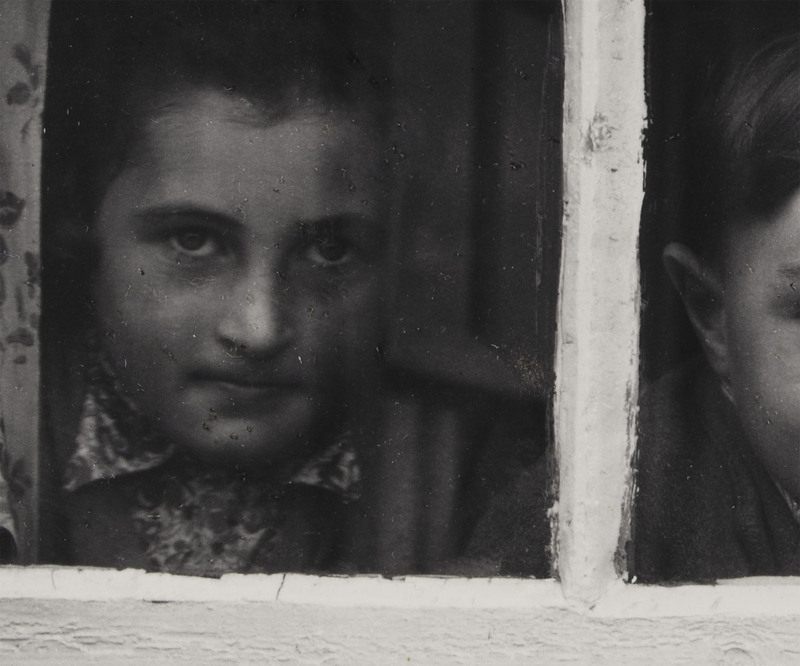 Paul Strand’s career spanned a period of revolutionary change both in the arts and in the wider world. Always motivated by a strong sense of social purpose, he came to believe that depicting the human struggle, both economic and political, was central to his responsibility as an artist. The exhibition begins with his rapid mastery of the prevailing Pictorialist style of the 1910s, reflected in serene landscapes such as The River Neckar, Germany (1911). 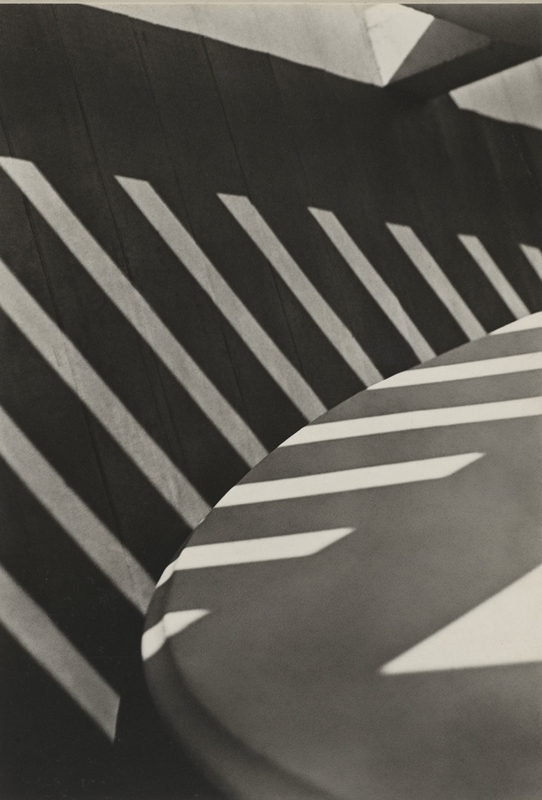 On view also are his innovative photographs of 1915-17 in which he explored new subject matter in the urban landscape of New York and innovative aesthetic ideas in works such as Abstraction, Porch Shadows, Twin Lakes, Connecticut (1916). These new directions in Strand’s photography demonstrated his growing interest both in contemporary painting – especially Cubism and the work of the American artists championed by Alfred Stieglitz – and in discovering for photography a unique means of expressing modernity. 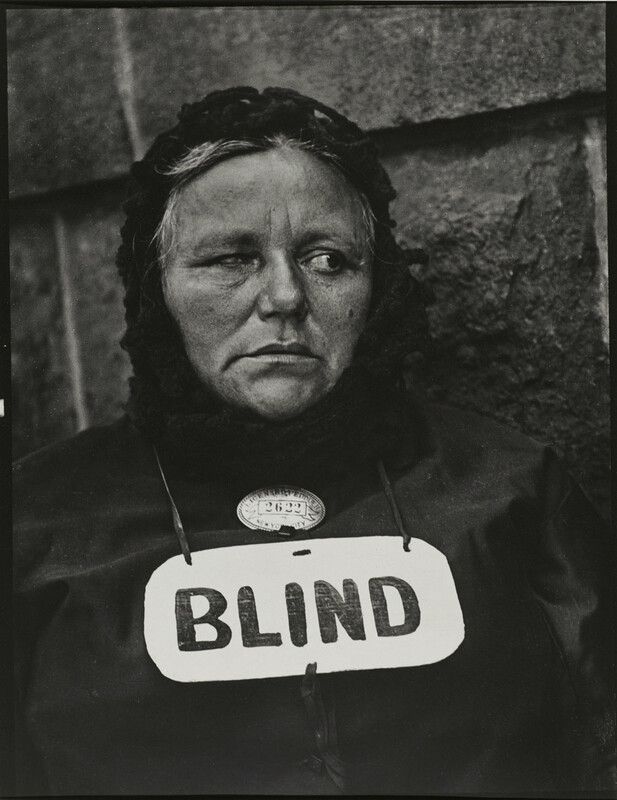 Strand’s work of this period includes candid, disarming portraits of people observed on the street – the first of their type – such as Blind Woman, New York (1916), and Wall Street, New York (1915), an arrangement of tiny figures passing before the enormous darkened windows of the Morgan Trust Company Building, which illustrates Strand’s fascination with the pace of life and changing scale of the modern city. During the 1920s – a period often called “the Machine Age” – Strand became transfixed by the camera’s capacity to record mesmerizing mechanical detail. At this time his ideas about the nature of portraiture began to expand significantly. These new and varied concerns can be seen in the sensuous beauty of close-up images of his wife, Rebecca Salsbury Strand, to cool, probing studies of his new motion picture camera, such as Akeley Camera with Butterfly Nut, New York (1922-23). 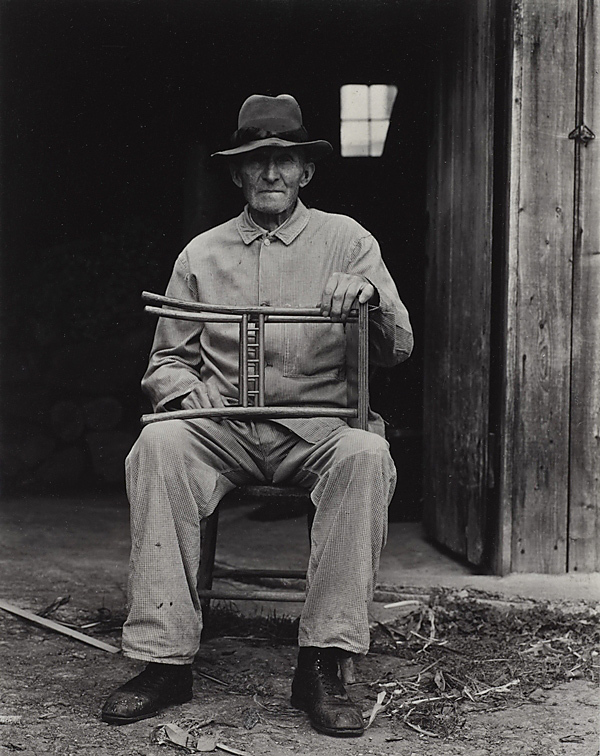 His ideas about portraiture also extended to his growing preoccupation with photographic series devoted to places beyond New York, such as the southwest and Maine, where he would make seemingly ordinary subjects appear strikingly new. 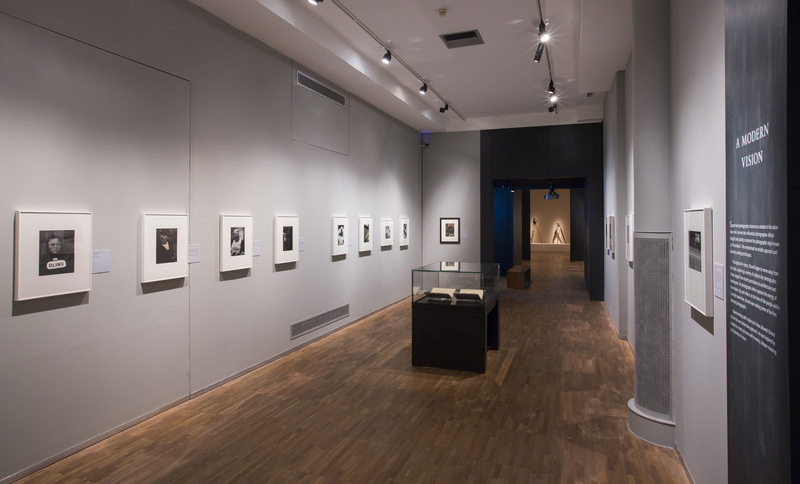 The exhibition looks at Strand’s widening engagement with his fellow artists of the Stieglitz circle, placing his works alongside a group of paintings by Georgia O’Keeffe, Marsden Hartley, Arthur Dove, and John Marin, as well as photographs by Stieglitz, who played an important role in launching Strand’s career. These juxtapositions reveal the rich interaction between Strand and his friends and peers during this time. Over the next several decades Strand traveled widely, seeking always to establish a broader role for photography. 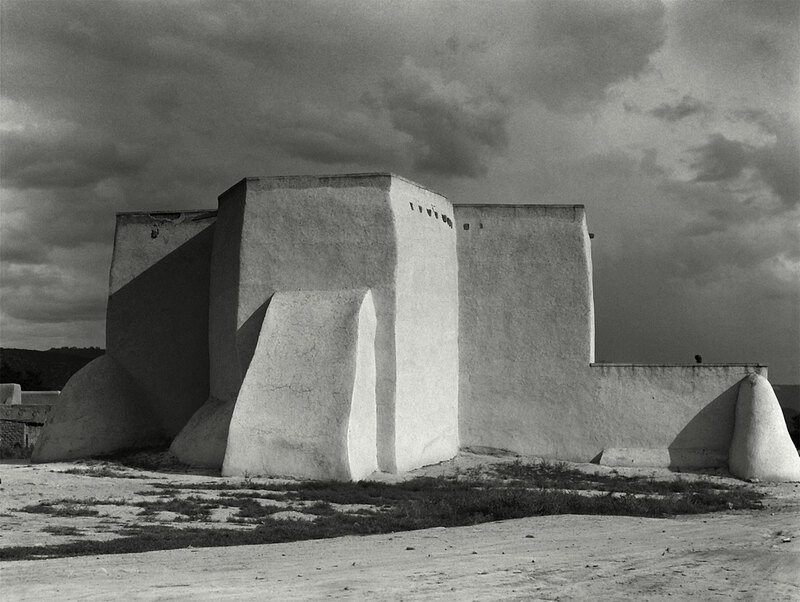 The exhibition conveys his growing interest in the medium’s unique ability to record the passage of time and the specific qualities of place, as seen in Elizabethtown, New Mexico (1930), one of many photographs he made of abandoned buildings. 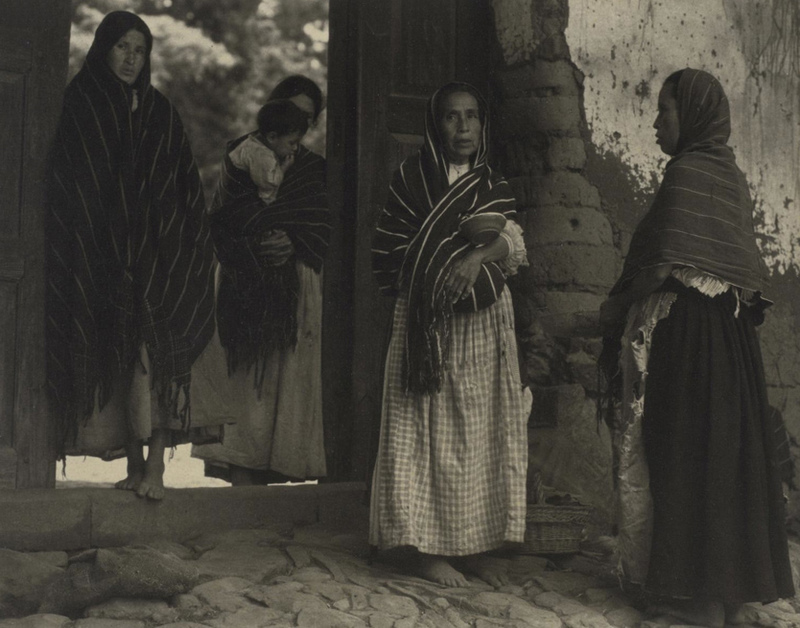 It shows Strand returning to a core motif – the portraiture of anonymous subjects – during the time when he lived in Mexico, from 1932 to 1934. This period abroad had a profound influence on him, deepening his engagement with the politics of the left. Many of the works he created at this time, whether depicting individuals, groups of people, or even religious icons, show in their exceptional compositions a deep empathy. 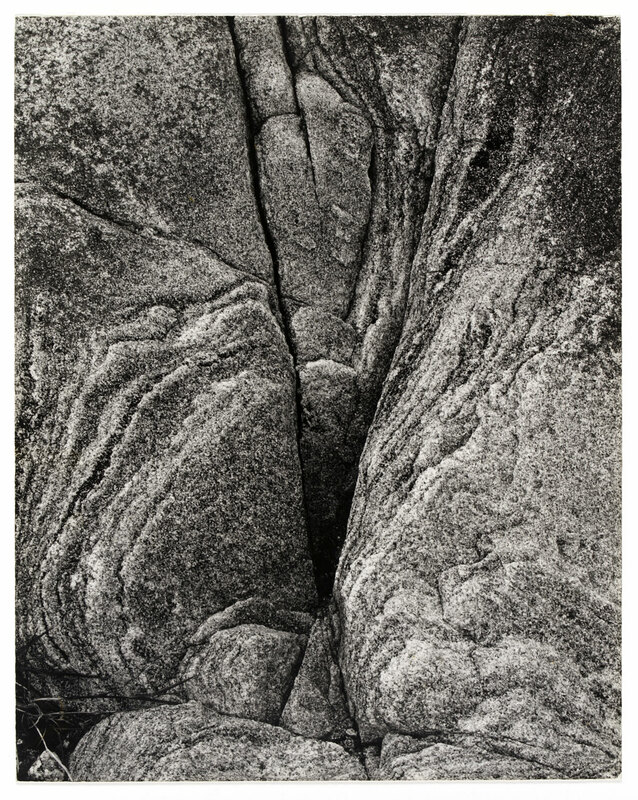 This can also be seen in his series devoted to Canada’s Gaspé Peninsula from the same decade. 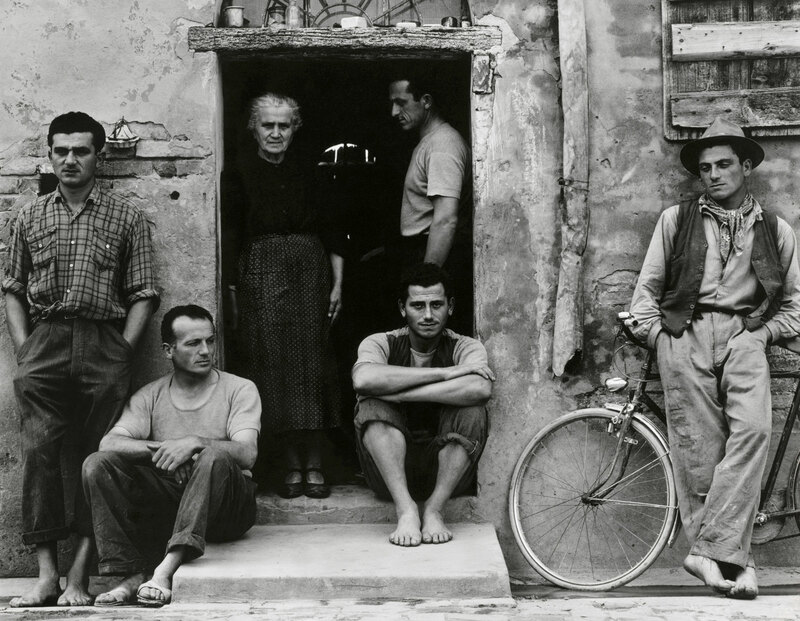 The exhibition also highlights his project in Luzzara, Italy (1953), where he focused his attention on the everyday realities of a northern village recovering from the miseries of war and fascism. 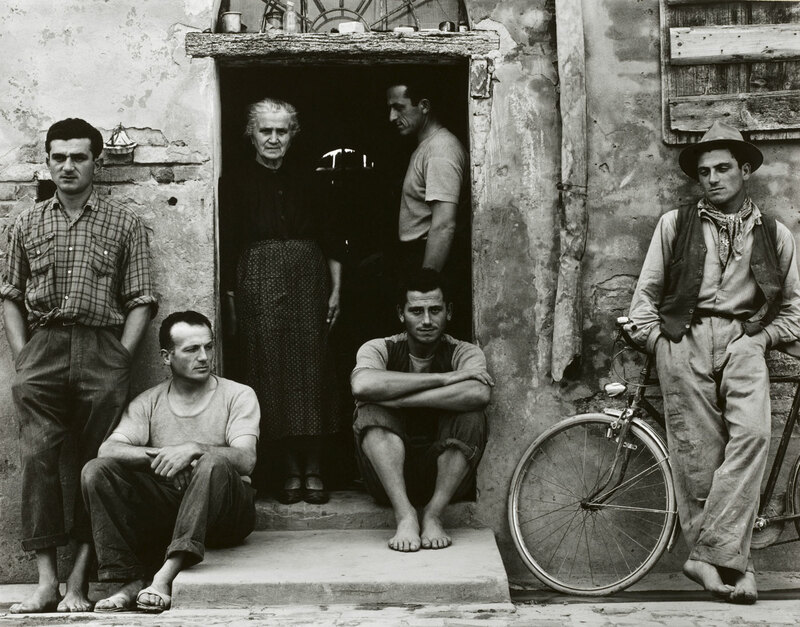 This series is centered on images of townspeople, as seen in The Family, Luzzara (The Lusettis) (1953), and fulfills his long-held ambition to create a major work of art about a single community. 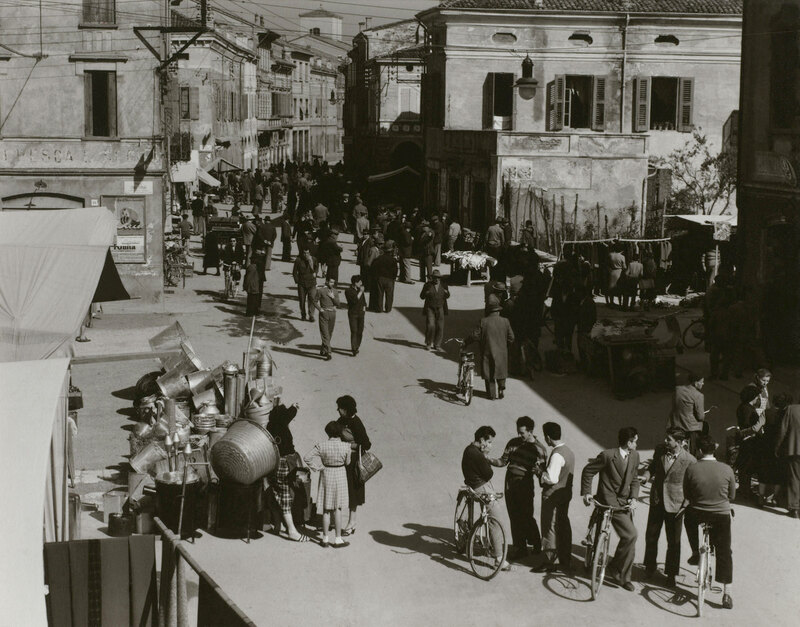 Strand’s photographs of Luzzara were published in Un Paese: Portrait of an Italian Village (1955). In 1963, Strand was invited to Ghana at the invitation of Kwame Nkrumah, its first president following the end of British rule. 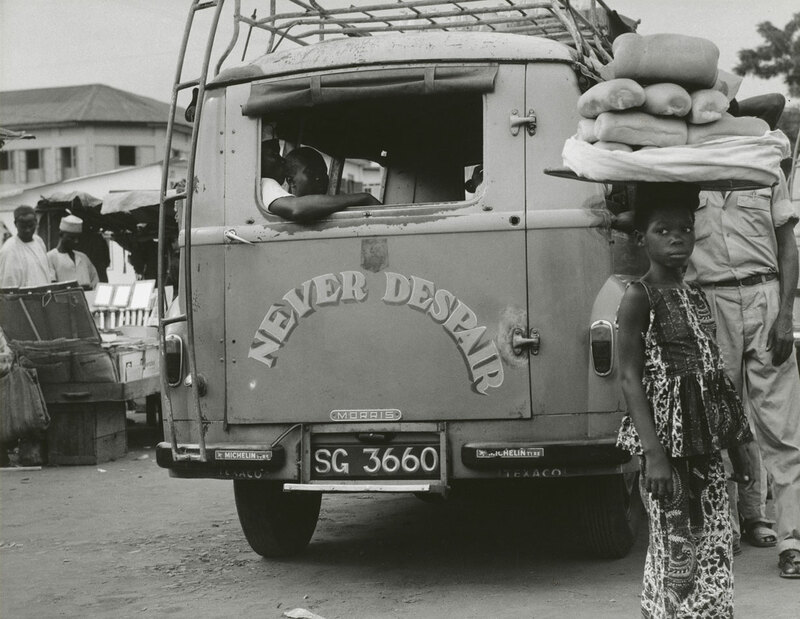 Fascinated by Ghana’s democracy during these years, Strand was excited to photograph a place undergoing rapid political change and modernization. 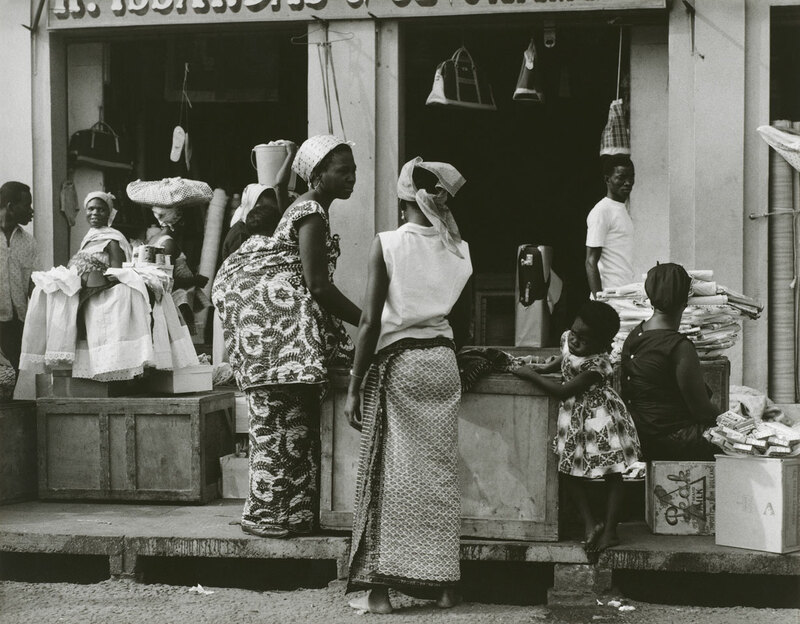 He saw modernity in the efforts of a newly independent nation to chart its future unfolding simultaneously alongside traditional aspects of Ghanaian culture. 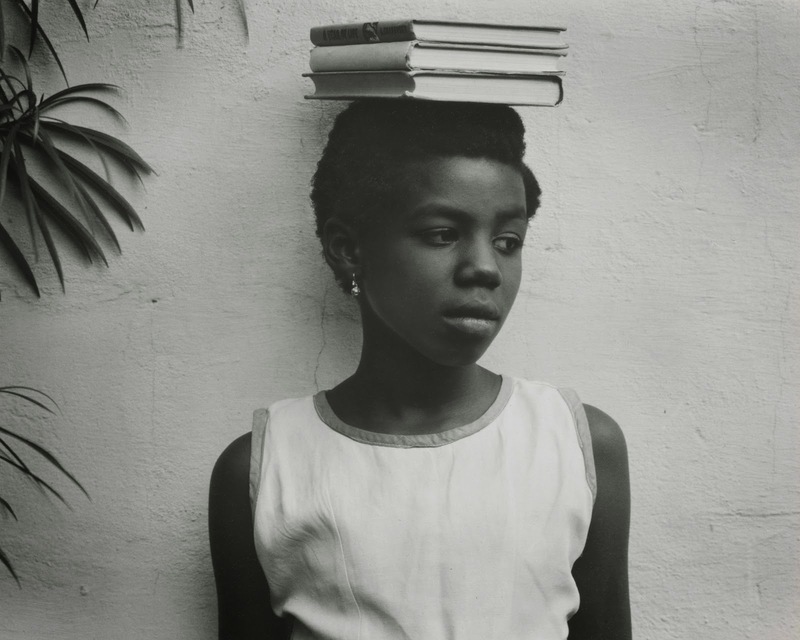 Portraiture was central to the project, as seen in Anna Attinga Frafra, Accra, Ghana (1964), in which a young schoolgirl balances books on her head. 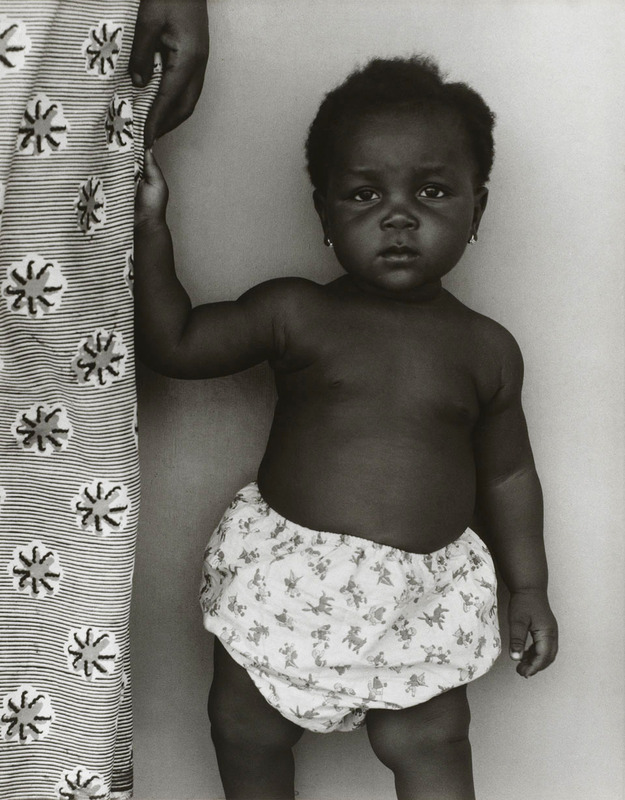 The project led to the publication of Ghana: An African Portrait (1976). 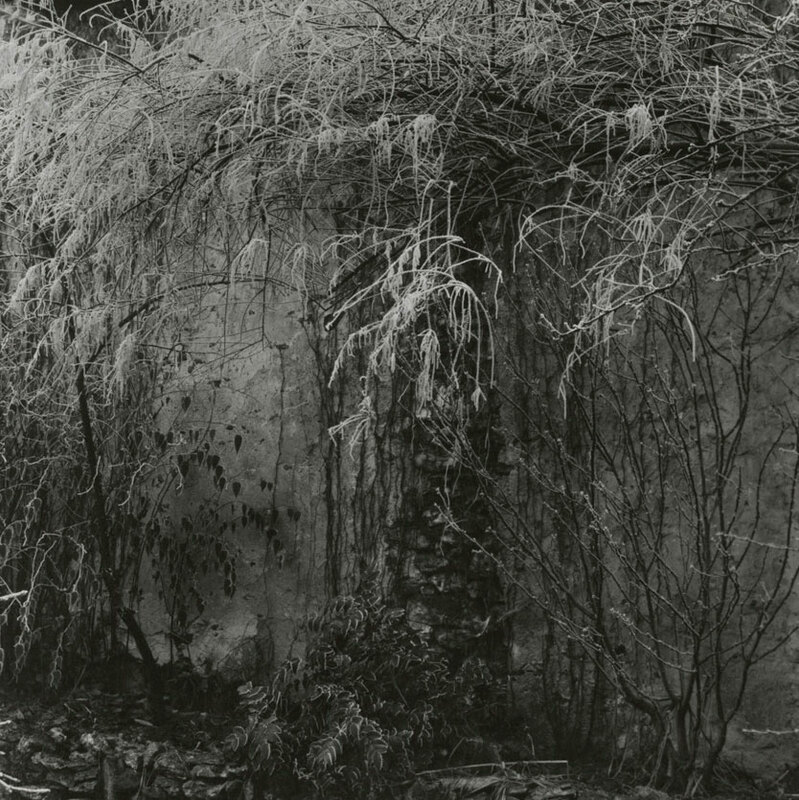 In Strand’s later years, he would increasingly turn his attention close to his home in Orgeval, outside Paris, often addressing the countless discoveries he could make within his own garden. There he produced a remarkable series of still lifes. These were at times reflective of earlier work, but also forward-looking in their exceptional compositions that depict the beauty of myriad textures, free-flowing movement, and evoke a quiet lyricism. 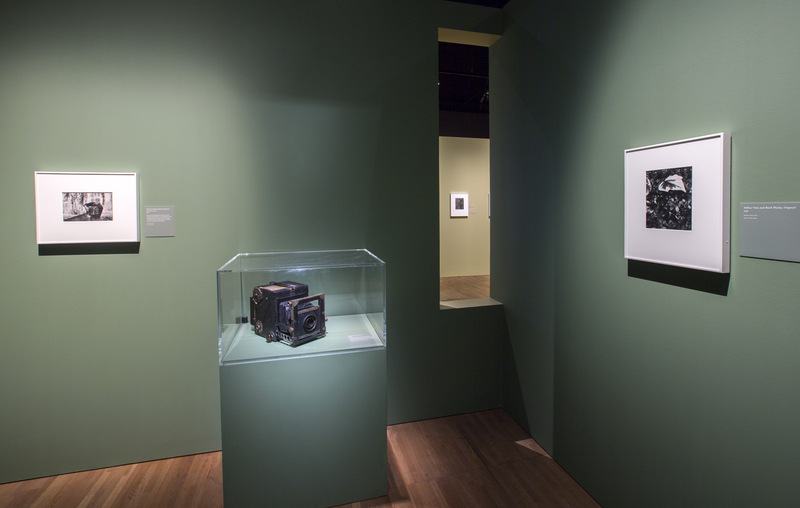 In addition to Strand’s still photography, the exhibition features three of his most significant films. Manhatta (1921), his first film and an important collaboration with painter and photographer Charles Sheeler, will be shown in full. This brief non-narrative “scenic” is considered the first American avant-garde film. It portrays the vibrant energy of New York City, juxtaposing the human drama on the street with abstracted bird’s-eye perspectives taken from high buildings and scenes of the ferry and harbor, all punctuated by poetry from Walt Whitman. Two of the films are seen in excerpts. 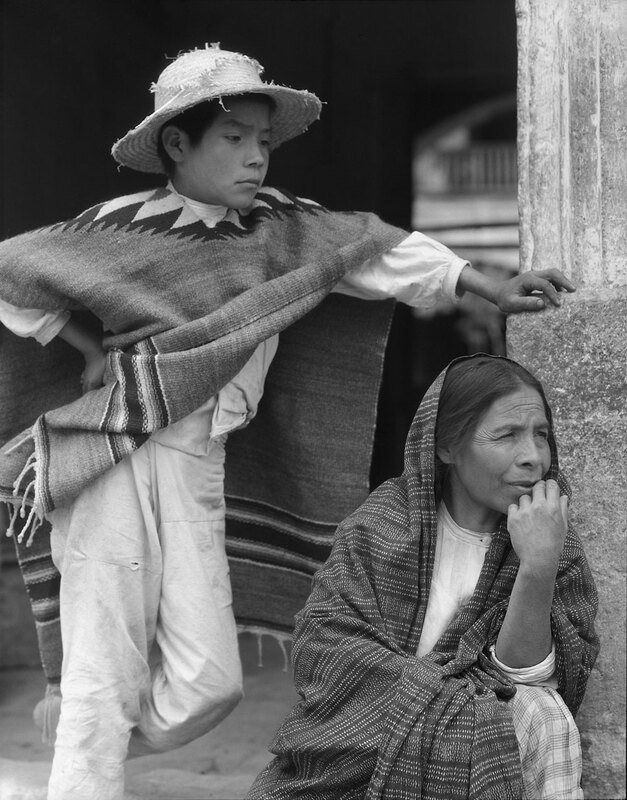 Redes (1936), Strand’s second film, reflects the artist’s growing social awareness during his time in Mexico. Released as The Wave in the U.S., the film is a fictional account of a fishing village struggling to overcome the exploitation of a corrupt boss. Native Land (1942) is Strand’s most ambitious film. Co-directed with Leo Hurwitz and narrated by Paul Robeson, it was created after his return to New York when Strand became a founder of Frontier Films and oversaw the production of leftist documentaries. Ahead of its time in its blending of fictional scenes and documentary footage, Native Land focuses on union-busting in the 1930s from Pennsylvania to the Deep South. When its release coincided with the Japanese attack on Pearl Harbor, it was criticized as out-of-step with the nation, leading Strand to return exclusively to still photography. 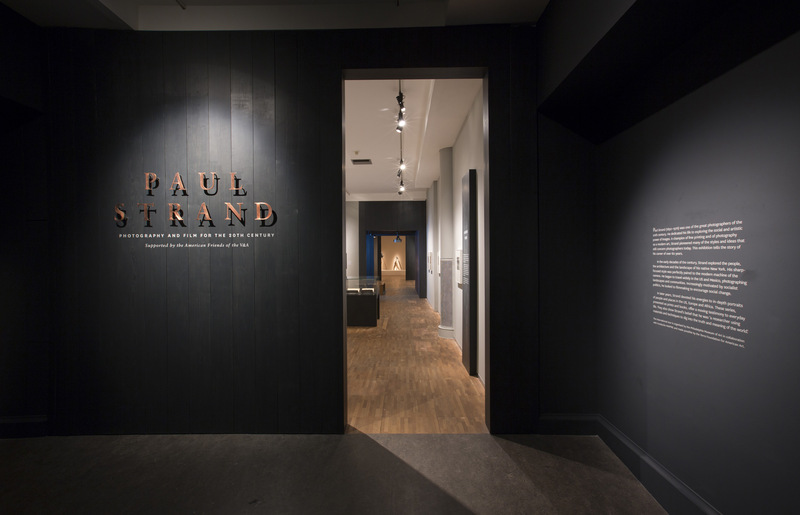 Paul Strand: Master of Modern Photography is curated by Peter Barberie, the Brodsky Curator of Photographs, Alfred Stieglitz Center at the Philadelphia Museum of Art, with the assistance of Amanda N. Bock, Project Assistant Curator of Photographs. Barberie said, “Whether he was printing in platinum, palladium, gelatin-silver, making films, or preparing books, Strand was ultimately more than a photographer. He was a great modern artist whose eloquent voice addressed the widest possible audience, and this voice continues to resonate today. 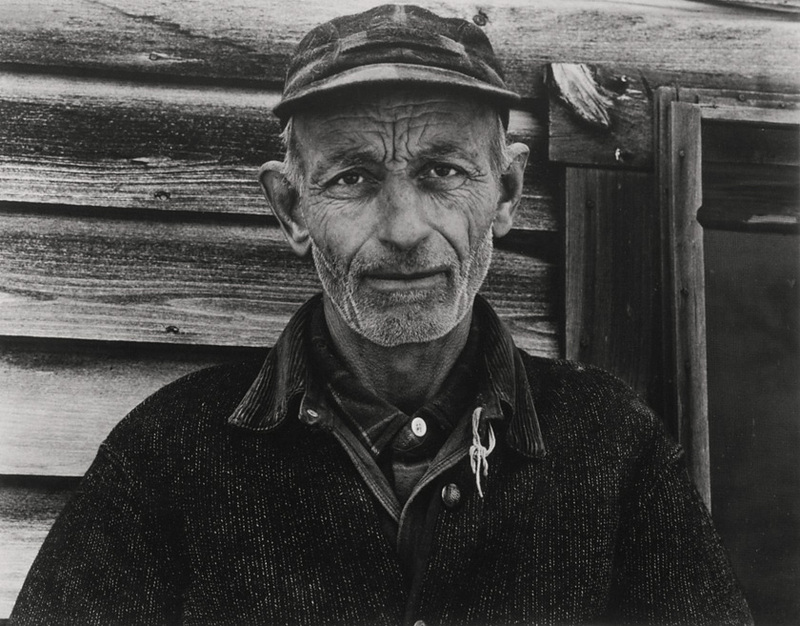 Born in New York City, Strand first studied with the social documentary photographer Lewis Hine at New York’s Ethical Culture School from 1907-09, and subsequently became close to the pioneering photographer Alfred Stieglitz. Strand fused these powerful influences and explored the modernist possibilities of the camera more fully than any other photographer before 1920. 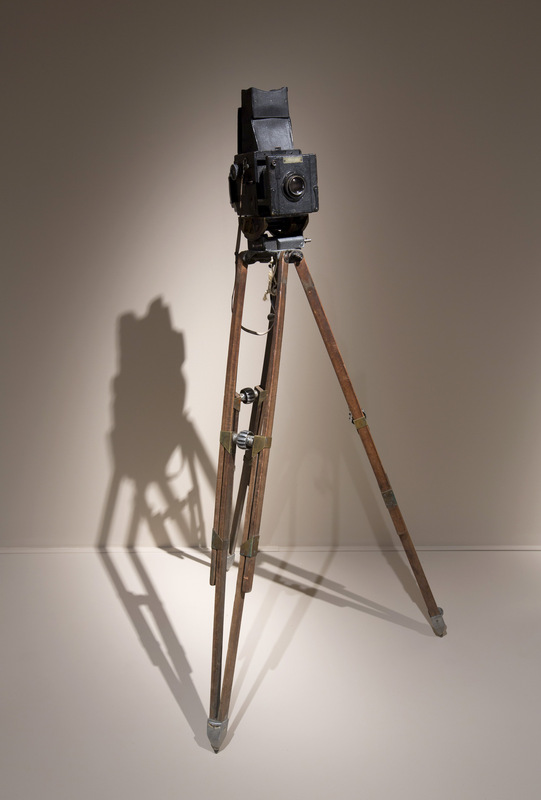 In the 1920s, Strand tested the camera’s potential to exceed human vision, making intimate, detailed portraits, and recording the nuances of machine and natural forms. 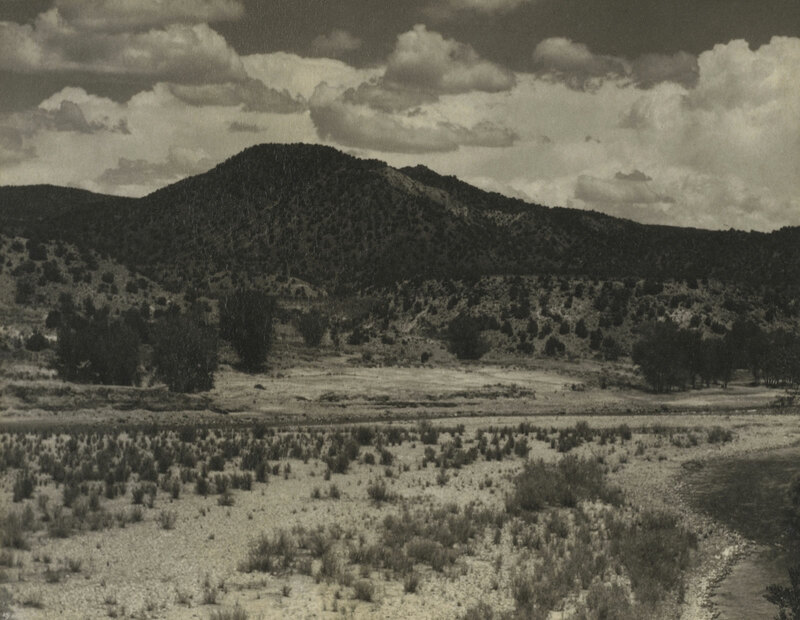 He also created portraits, landscapes, and architectural studies on various travels to the Southwest, Canada, and Mexico. 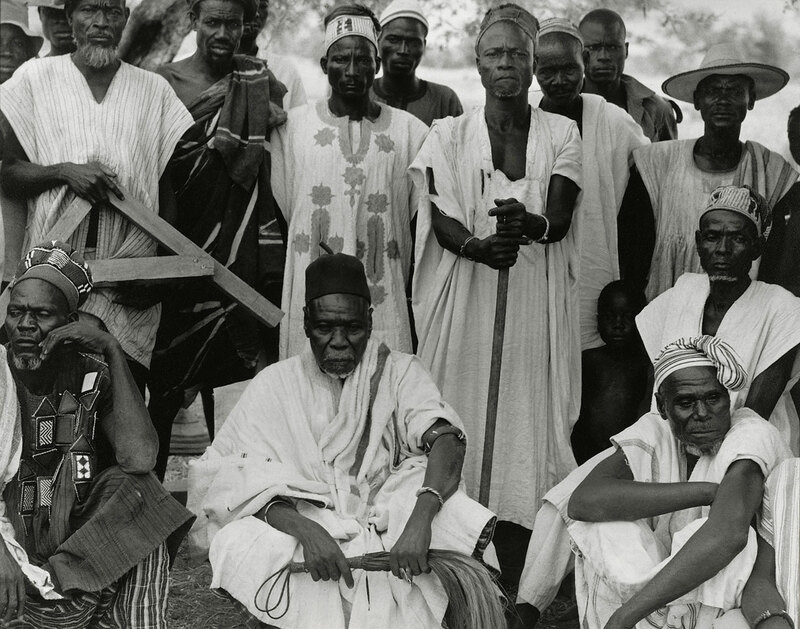 The groups of pictures of these regions, in tandem with his documentary work as a filmmaker in the 1930s, convinced Strand that the medium’s great purpose lay in creating broad and richly detailed photographic records of specific places and communities. For the rest of his career he pursued such projects in New England, France, Italy, the Hebrides, Morocco, Romania, Ghana, and other locales, producing numerous celebrated books. Together, these later series form one of the great photographic statements about modern experience. The last major retrospective dedicated to Strand was organized by the Philadelphia Museum of Art in 1971. In 2010, the Philadelphia Museum of Art began to acquire the core collection of photographs by Paul Strand. Through the generosity of philanthropists Lynne and Harold Honickman, Marjorie and Jeffrey Honickman, and H.F. “Gerry” and Marguerite Lenfest, the Museum received as partial and promised gifts from The Paul Strand Archive at the Aperture Foundation, as well as master prints from Strand’s negatives by the artist Richard Benson. 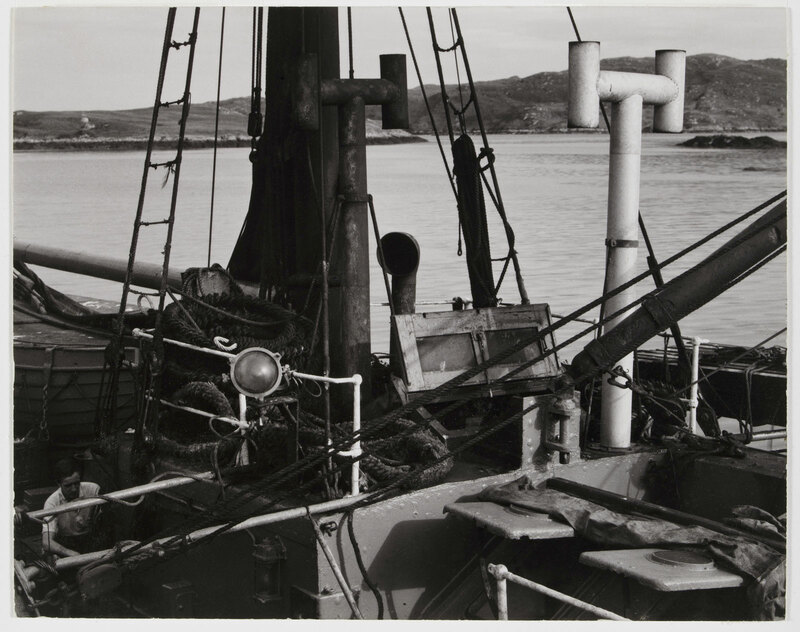 The Paul Strand Collection permits the study of Strand’s career with prints from the majority of his negatives, including variants and croppings of individual images. 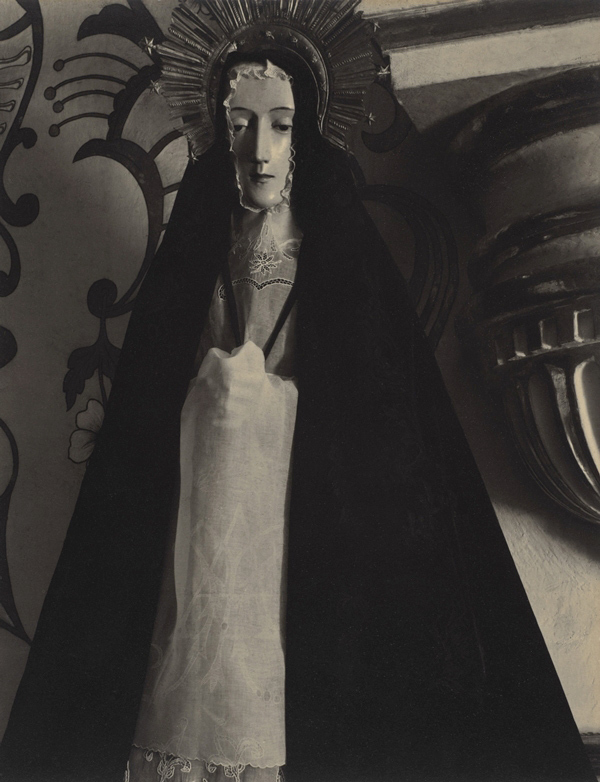 Together with other photographs already owned by the Museum, the acquisition makes the Philadelphia Museum of Art the world’s most comprehensive repository for the study of his work. Another fascinating exhibition from the J. Paul Getty Museum that features classic photographs and some that I have never seen before. 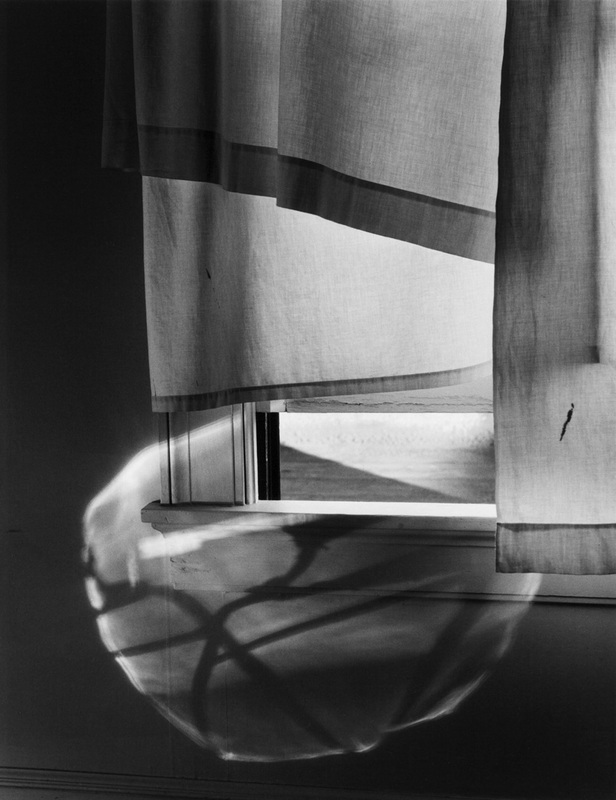 In my opinion, the two most famous photographs of windows have to be Minor White’s rhapsodic Windowsill Daydreaming, Rochester (1958, below) and Paul Strand’s Wall Street (1915, below, originally known as Pedestrians raked by morning light in a canyon of commerce) which, strangely, is not included in the exhibition. I can’t understand this omission as this is the seminal image of windows in the history of photography. “In this photo, taken by morning light 1915, the recently built J.P. Morgan Co. building appears sinister and foreboding and dwarfs (perhaps consumes even) the humanity of suited men and women, their long shadows dragging behind them, walked alongside its facade. 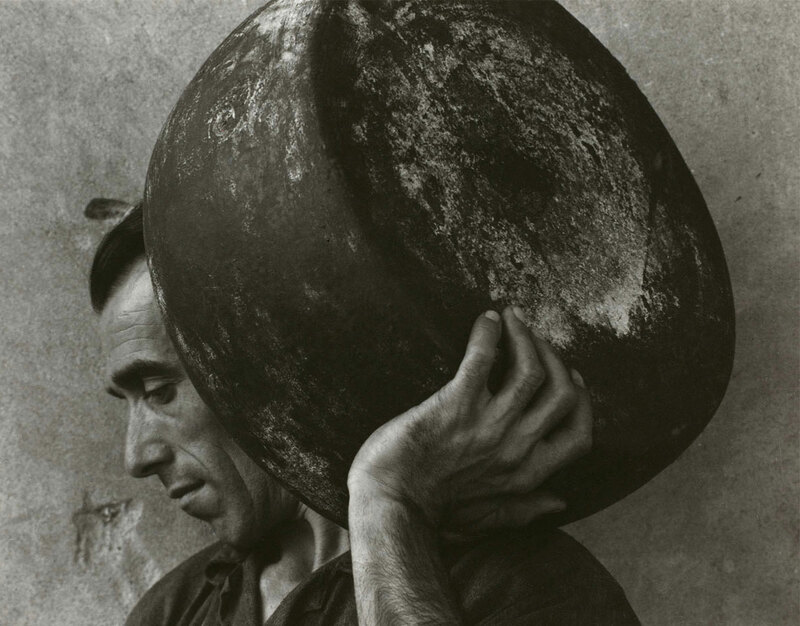 Paul Strand studied under Lewis Hine and Alfred Steiglitz. 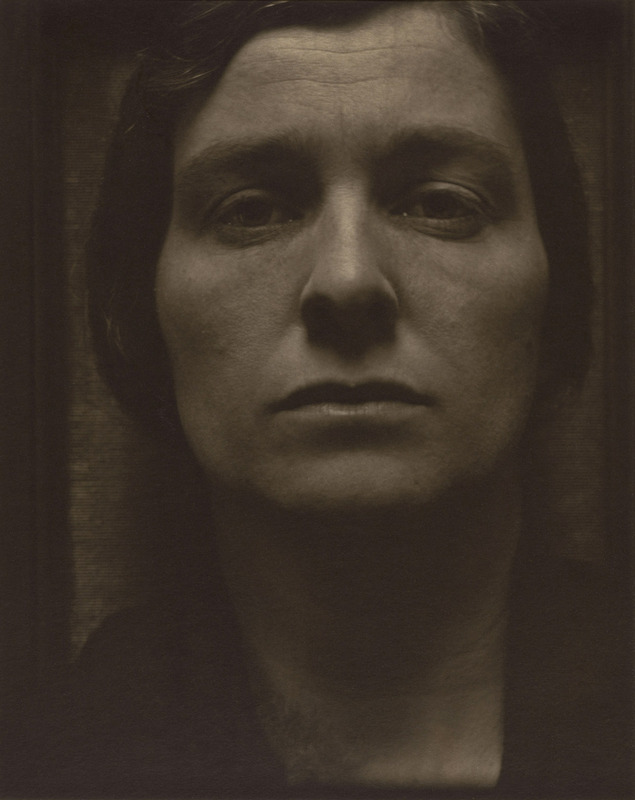 Although he set up in New York as a portriat photgrapher, Strand often visited Stieglitz’s gallery to see the new European painting which it exhibited. In 1914-15, under the influence of this new form of art, Strand turned from soft-focus pictoralism towards abstraction. It was in this spirit that the above photo was taken, originally named, “Pedestrians raked by morning light in a canyon of commerce”. Strand did not intended to show Wall Street in a bad light, he admitted. However, as the Great Depression happened (criticism was squarely towards Wall Street back then as it is today) and Strand turned more communist, he later spoke of “sinister windows” and “blind shapes” inherent in the above picture. “In many respects, the window was where photography began. 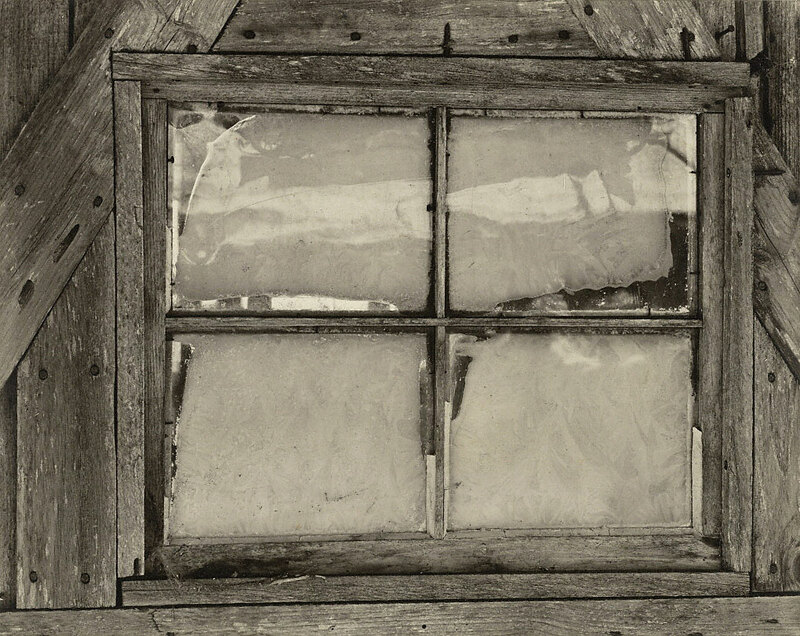 As early as 1826, the sill of an upstairs window in the home of the French inventor Joseph Nicéphore Niépce served as a platform for his photographic experiments. 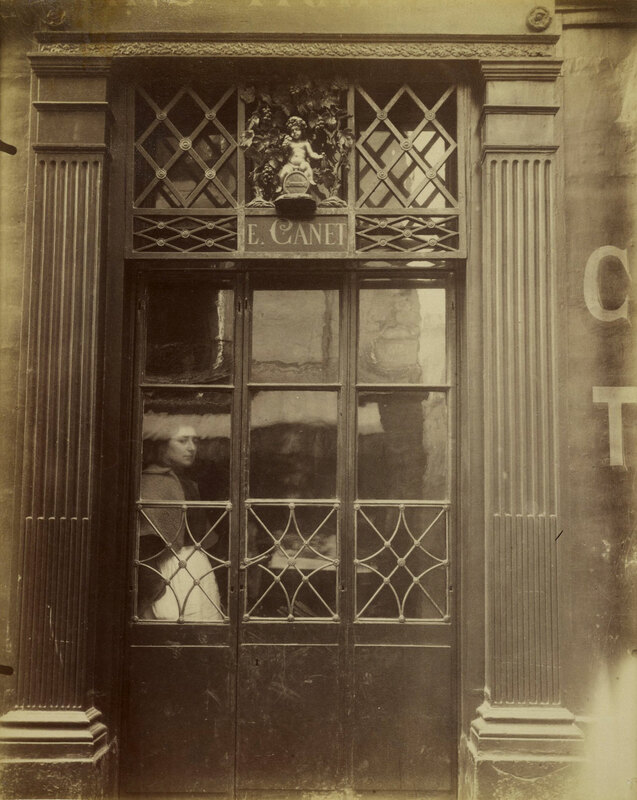 His View from the Window at Le Gras is today considered to be the first photograph. 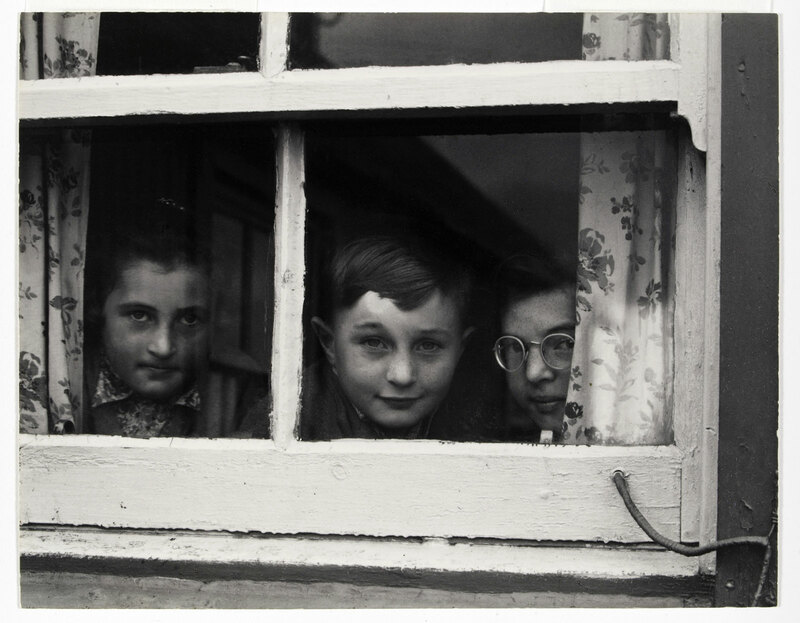 Since then, the window motif in photographs has functioned formally as a framing device and conceptually as a tool for artistic expression. It is also tied metaphorically to the camera itself which is, at its most rudimentary, a “room” (the word camera means “chamber”) and its lens a “window” through which images are projected and fixed. 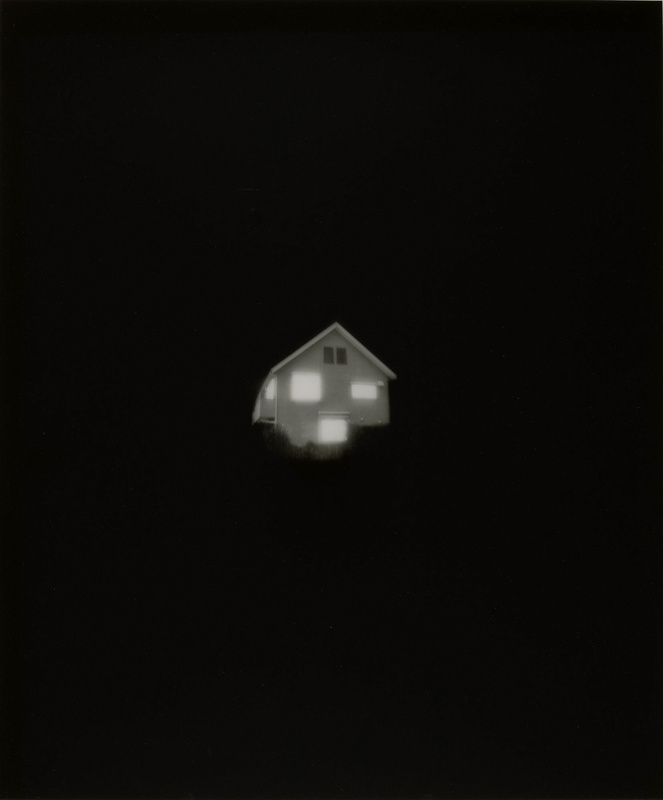 The photographs in At the Window: A Photographer’s View, on view October 1, 2013 – January 5, 2014 at the J. Paul Getty Museum, Getty Center, explore varying aspects of the window as frame or mirror – formally or metaphorically – for photographic vision. 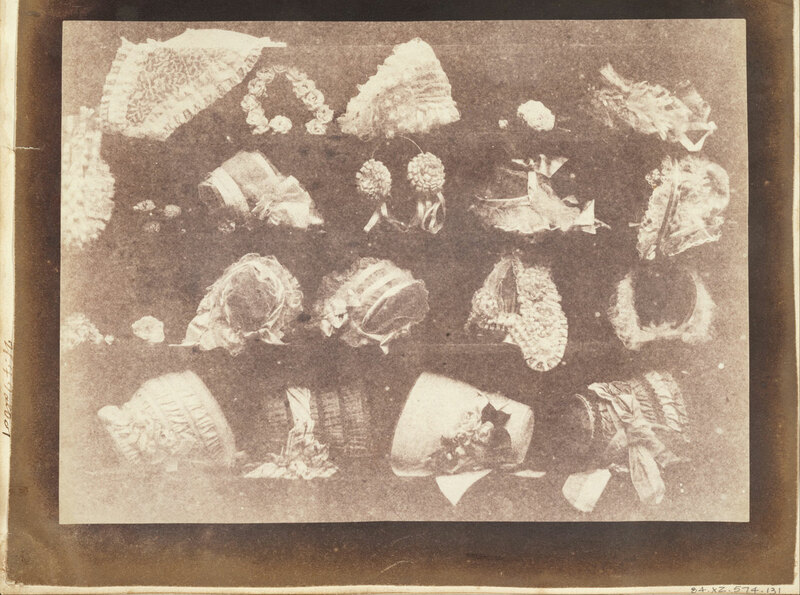 Featured in the exhibition is an exceedingly rare early photograph, William Henry Fox Talbot’s The Milliner’s Window (before January 1844) which depicts not an actual window but a carefully constructed one: shelves were placed outdoors and propped in front of black cloth, while various ladies’ hats were arranged to simulate the look of a shop display. 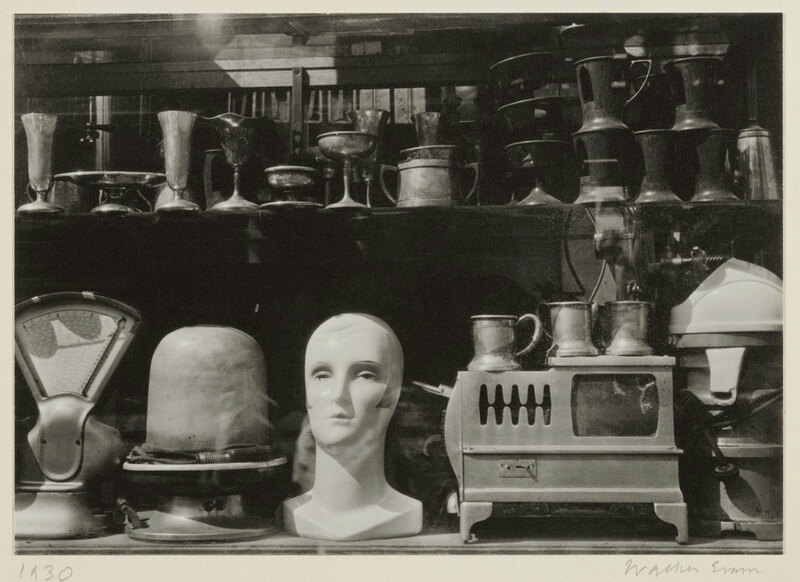 Throughout the history of photography, actual shop fronts have been a popular subject and reflections in their windows a source for unexpected juxtapositions. 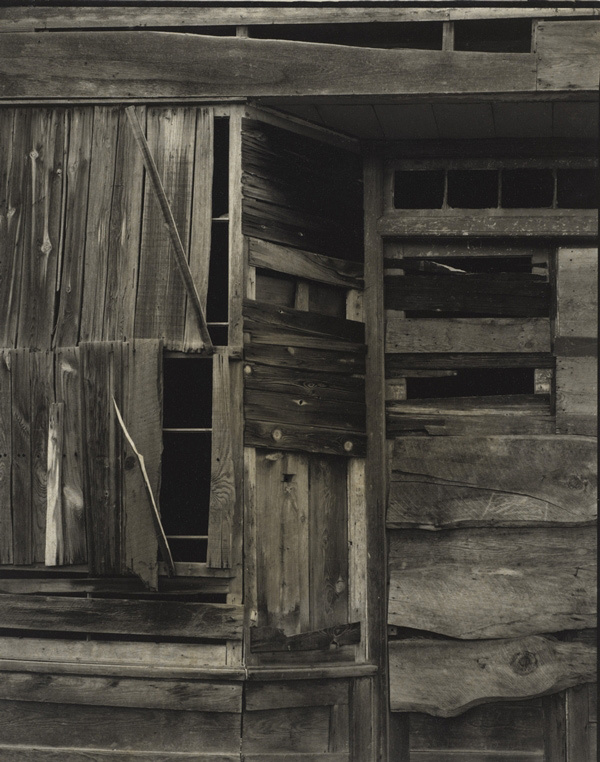 This motif is well represented in the exhibition with photographs by William Eggleston, Eugène Atget, and Walker Evans. Photographers have also taken an interest in the distinctive formal arrangements made possible by the architectural facades found in a cityscape. André Kertész’s Rue Vavin, Paris (1925), a view from his apartment window, is one of the first photographs he took upon arriving in Paris from Budapest. Photographers like Alfred Stieglitz carefully framed their views of urban exteriors, using the window as a unifying device within the composition. While windows provide an opportunity to observe life beyond a single room, the camera’s lens opens a window to the world at large. 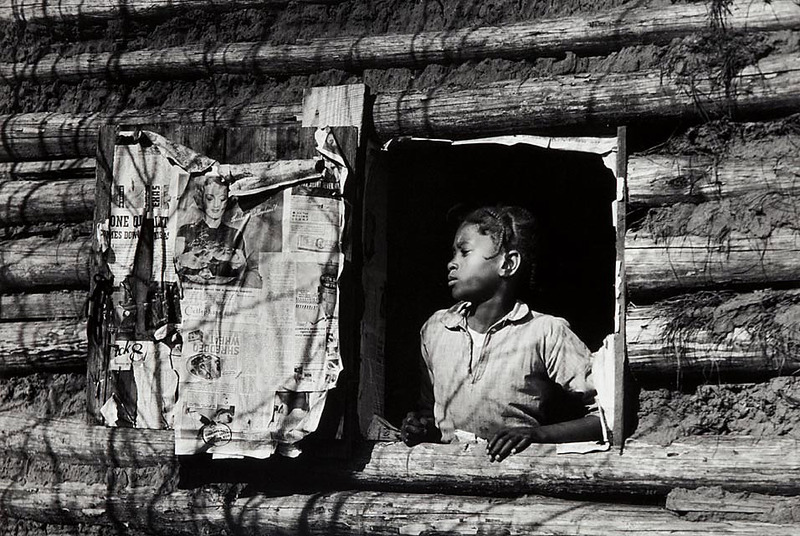 Arthur Rothstein believed in photography’s ability to enact social change – his Girl at Gee’s Bend (1937) features a young girl framed in the window of her log-and-earth home in Alabama, highlighting the schism between magazine images and the actual lives of most Americans at the time. 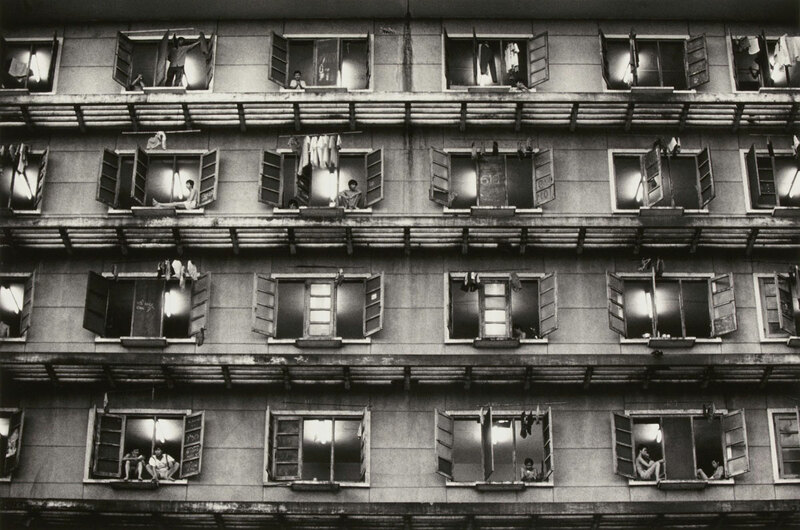 Similarly, Robert Frank’s Trolley – New Orleans (1955) frames racial segregation through windows in a trolley, while Sebastião Salgado’s Ho Chi Minh City, Vietnam (negative 1995; print 2009) uses the barely separated windows of a housing structure to evoke the cramped quarters and dire economic situation of its inhabitants. The Window in Photographs (Getty Publications, $24.95, hardcover) investigates the recurrence of windows both as a figurative and literal theme throughout the history of photography. From the very vocabulary we use to describe cameras and photographic processes to the subjects of world-renowned photographers, windows have long held powerful sway over artists working in the medium. 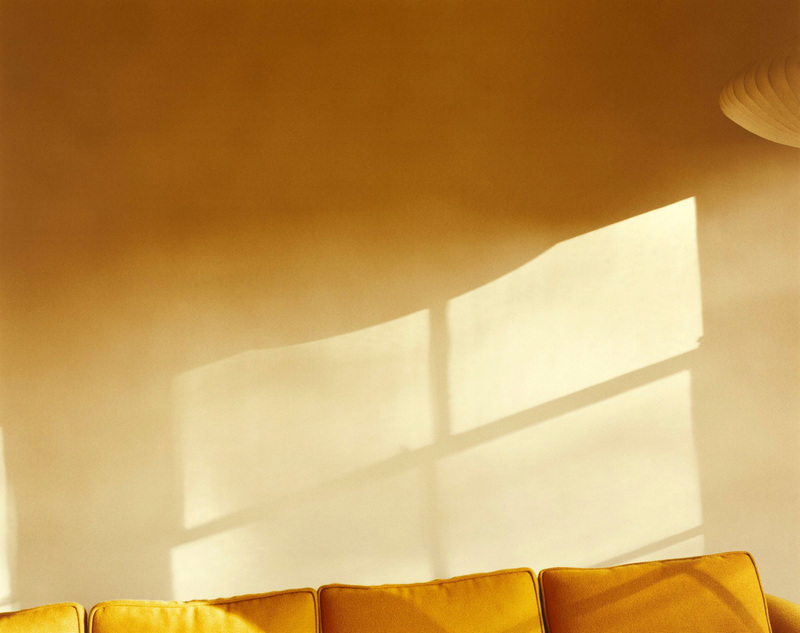 When documented on film, windows call into question issues of representation, the malleability of perception, and the viewer’s experience of the photograph itself, and the window’s evocative power is often rooted in the interplay between positive and negative, darkness and light, and inside and out. Many thankx to La Casa Encendida for allowing me to publish the photographs in the posting. Please click on the photograph for a larger version of the image. 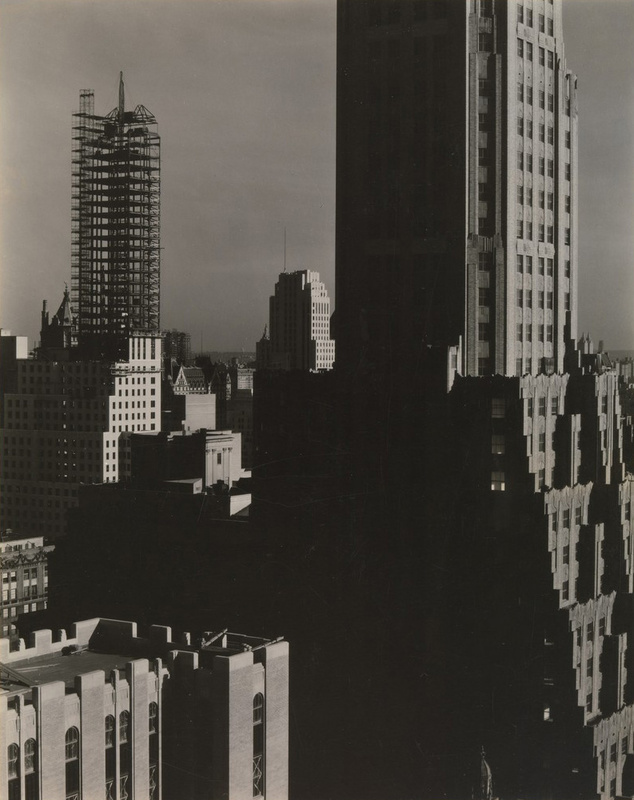 This photograph depicts the J.P. Morgan building in New York City. Strand photographed “people hurrying to work past the banking building” situated on Wall Street, from which the photo takes its name. the subject depicted is a real-life subject without manipulation. 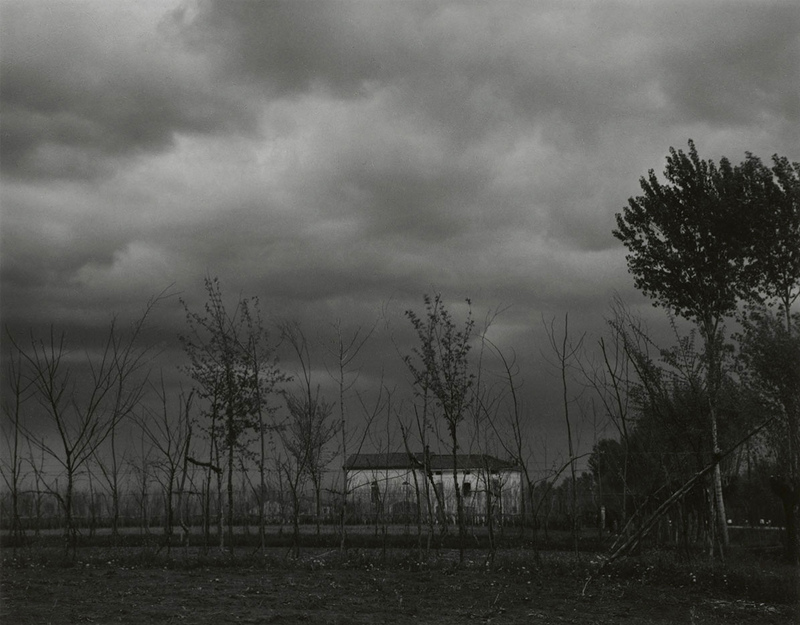 The depiction of the real nature of the medium and the subject is an example of straight photography. There is no focal point, with the lines converging off of the frame of the image. The financial building take majority of the frame. Emphasis is placed on the strong shapes created by the architecture of the building. The workers are included in the image, but are faceless and are trumped in size by the massive square shapes from the building they walk past. Also, the workers are captured in motion which on film makes them appear blurry. This aesthetic that Strand creates in Wall Street is his break toward the modern, the straight photography, demonstrating that pictorialism is no longer part of his aesthetic. Strand captured the building with clean, sharp lines. The building is covered in the high contrast, chiaroscuro. It is heavily in the shadows, but still creates an overwhelming presence over the people that walk past it. 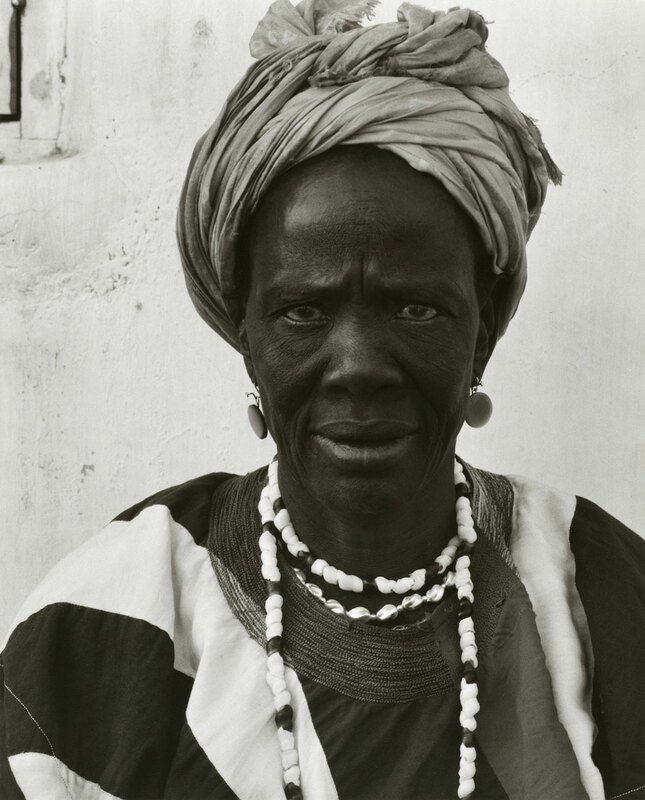 These people are also shrouded in the contrast made evident with the clean lines and black and white nature of his photos and photography as a medium. The people jump from their places, being the dark figures in the light of the sun that beams in from the left of the frame. Strand fills the image with his recognisable aesthetic. 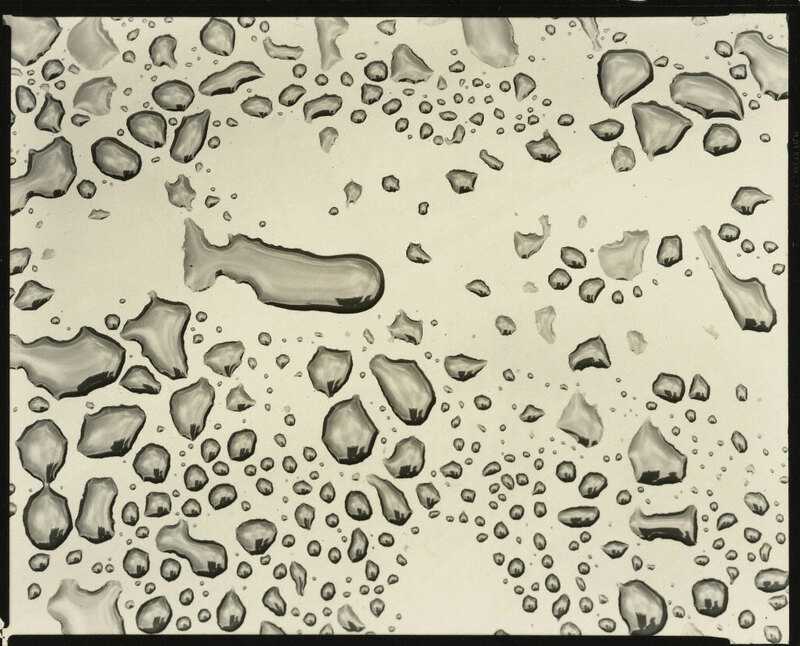 The photo is platinum print, one of the materials frequently used by photographers of the time. Strand was unique in how he printed his photos. As stated on the George Eastman House website section Notes on Photography, Strand would make large prints from small negatives. He also left them in their matte condition that was inherent with platinum print. 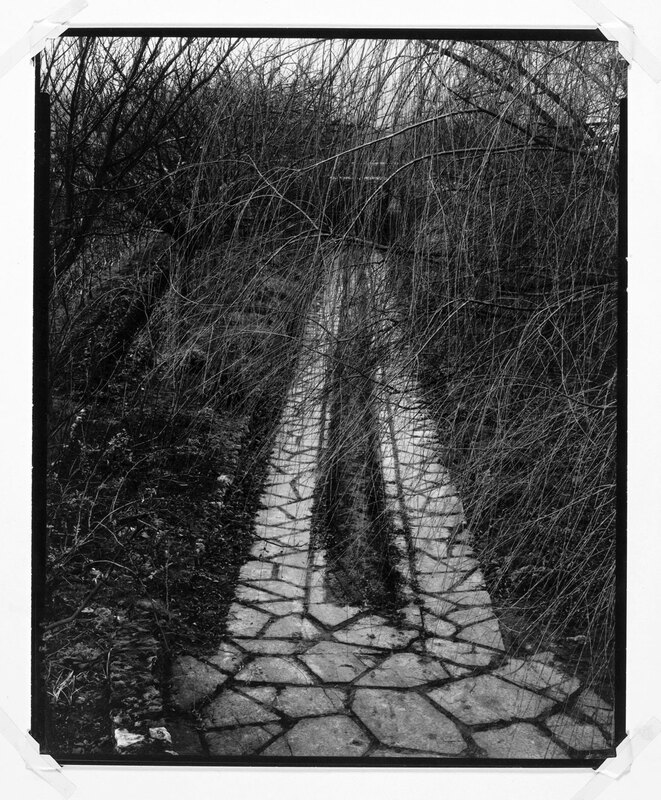 With his printing techniques, he “added a richness to the image.” As with the time, the photo is entirely black and white. There is a heavy contrast with the black and white areas of the photo. Strand creates diagonal shapes that pull emphasis to subject of the building and away from the people. Having taken Hine’s class at the Ethical Culture Fieldston School, social change became important to Strand and appeared often in his art. As a pupil of Hine, Strand learned of the social aspect his work could have. With Wall Street, he sought to portray a social message. He captured the faceless people next to the looming financial building in order to give a warning. Strand shows “the recently built J.P. Morgan Co. building, whose huge, dark recesses dwarf the passersby with the imposing powers of uniformity and anonymity.” The people cannot escape the overwhelming power that this modern establishment will have on their future and the future of America. He warns us to not be the small people that look almost ant-like next to this building that has a massive amount of control over the American economy. 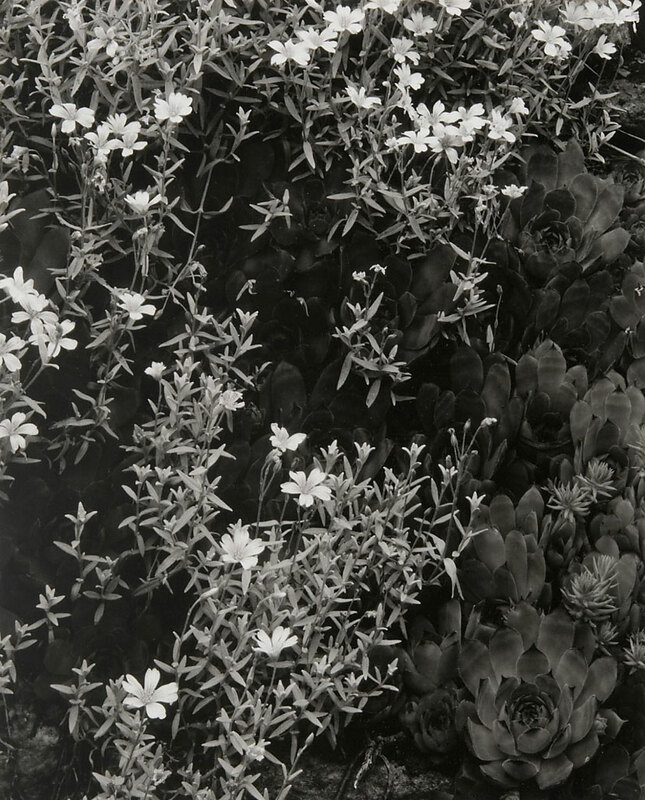 Ted Croner (1922-2005) was an American photographer, described as an influential member of the New York school of photography during the 1940s and 1950s. His images are said to represent the best example of this movement. 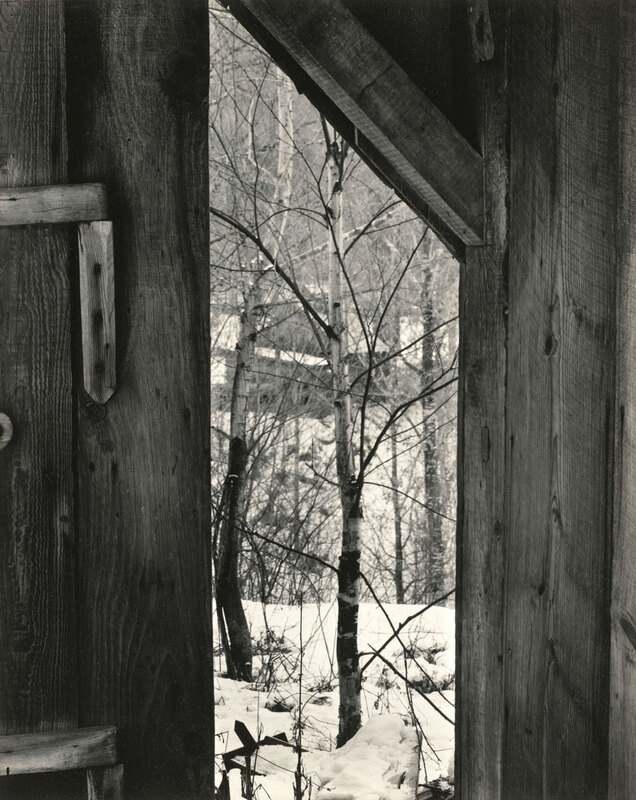 Born in Baltimore in 1922 and raised in North Carolina, Croner developed an interest in photography while in high school. 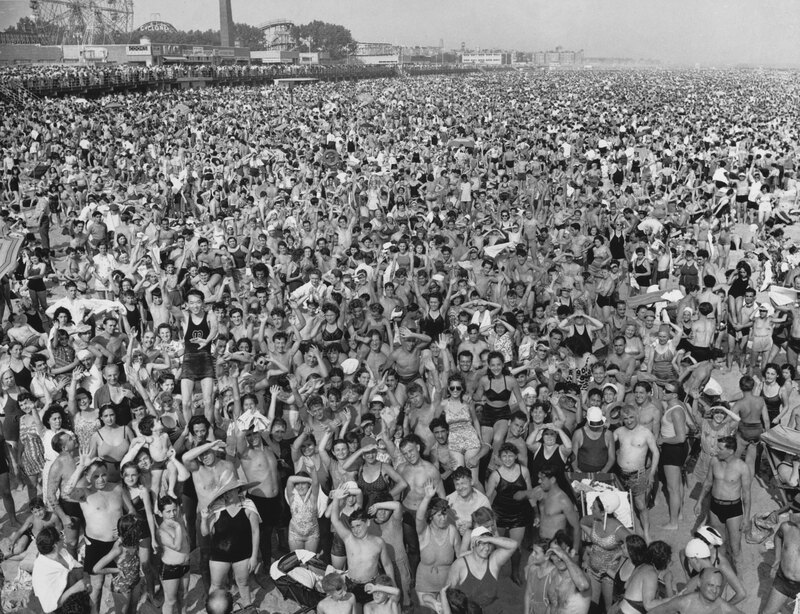 He honed his skills while serving as an aerial photographer in World War II before settling in New York City in 1947. 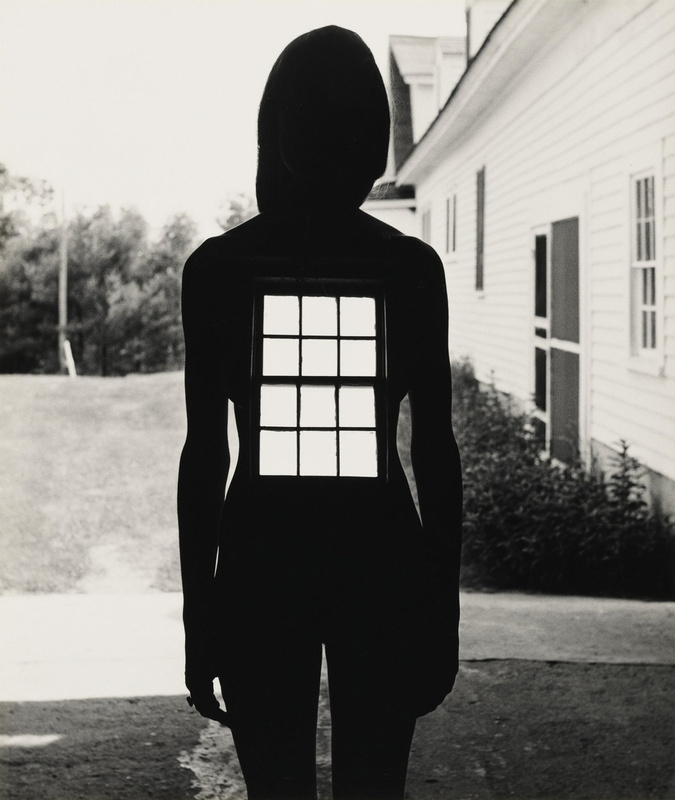 At the urging of fashion photographer Fernand Fonssagrives, he enrolled in Alexey Brodovitch’s class at The New School where he studied with Diane Arbus, Richard Avedon and Lisette Model. During this period he produced many of his most memorable images including “Taxi, New York Night, 1947-48”, which appears on the cover of Bob Dylan’s 2006 album, Modern Times. Another of Croner’s photographs was used on the cover of Luna’s album Penthouse. Croner also had a successful career as a fashion and commercial photographer – his work was published in Harper’s Bazaar and Vogue. He also worked extensively with corporations such as Coca-Cola and Chase Manhattan Bank. 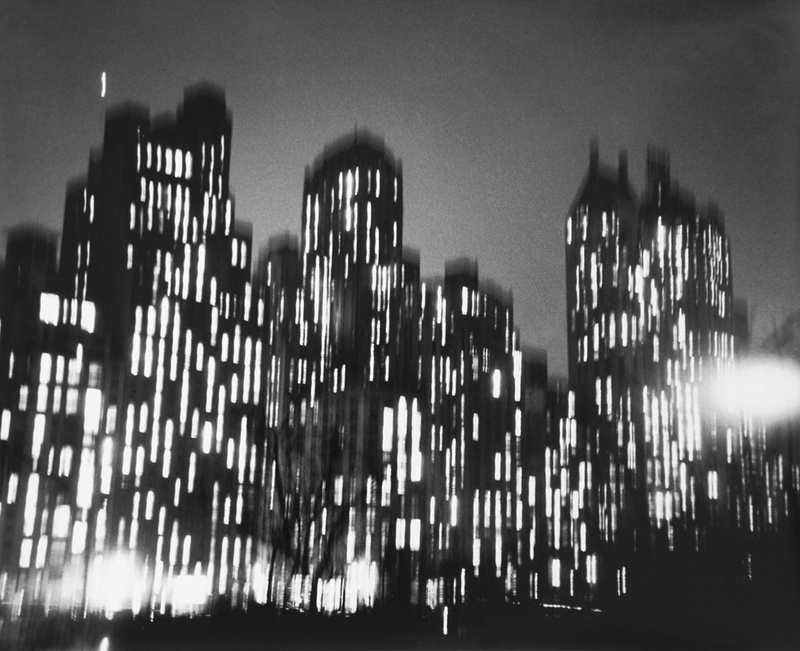 Croner is best known for his haunting night images of New York City taken in the 1940s and 1950s. He was one of several important photographers who belonged to the New York school of photography. 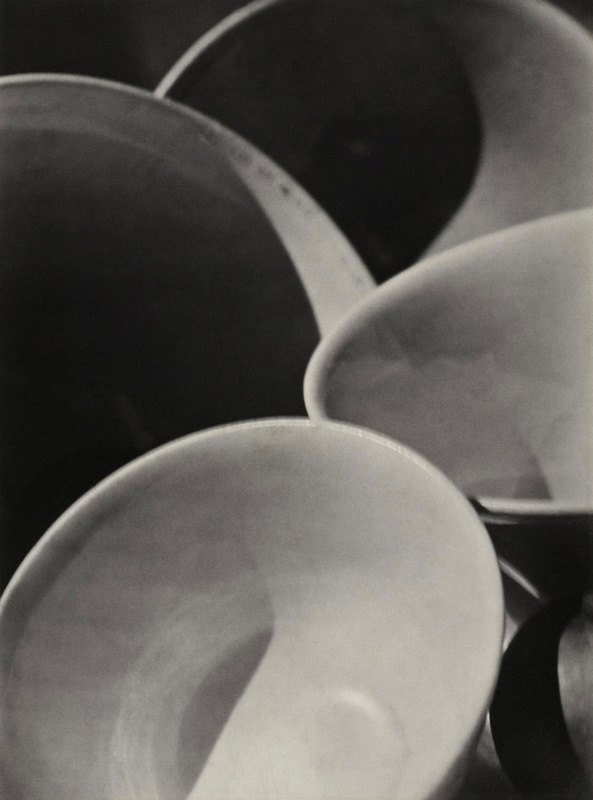 “Photographs from the MoMA, which will provide an in-depth look at an essential component of the MoMA’s assets: its photography collection. 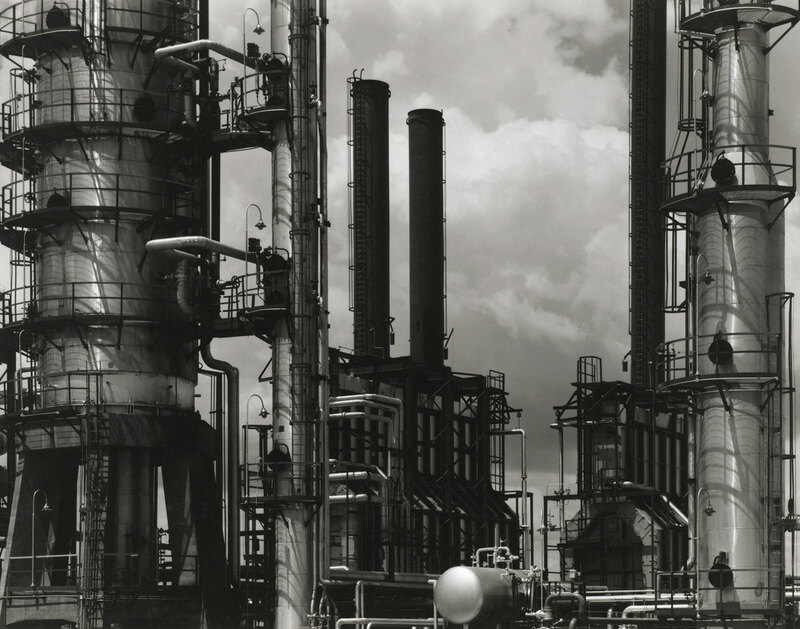 Curated by Sarah Hermanson Meister, associate curator of the museum’s department of photography, the exhibition offers an overview of the history of photography through the work of over 90 artists, with the iconic city as a backdrop. 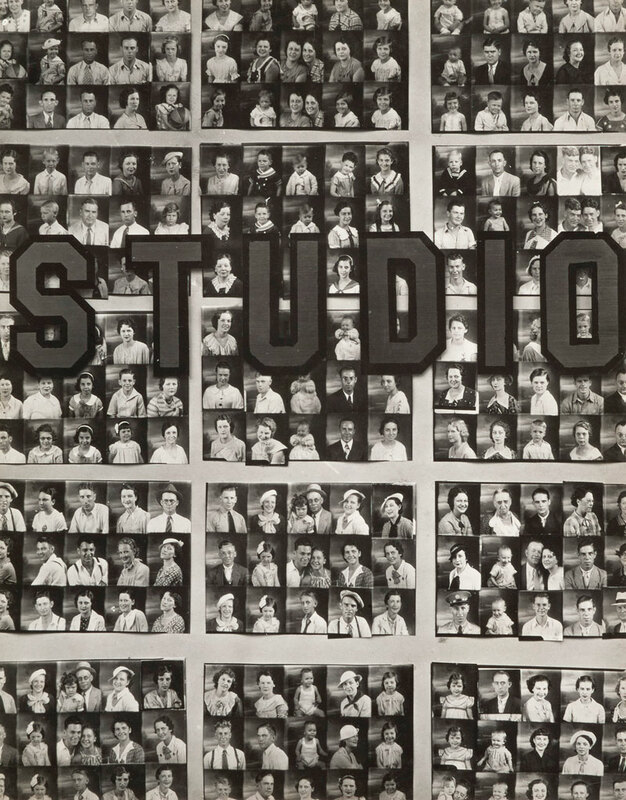 It includes some of the most prestigious names in photography, such as Berenice Abbott, Diane Arbus, Harry Callahan, Henri Cartier-Bresson, Walter Evans, Lee Friedlander, Helen Levitt, Cindy Sherman, Irving Penn and Alfred Stieglitz. 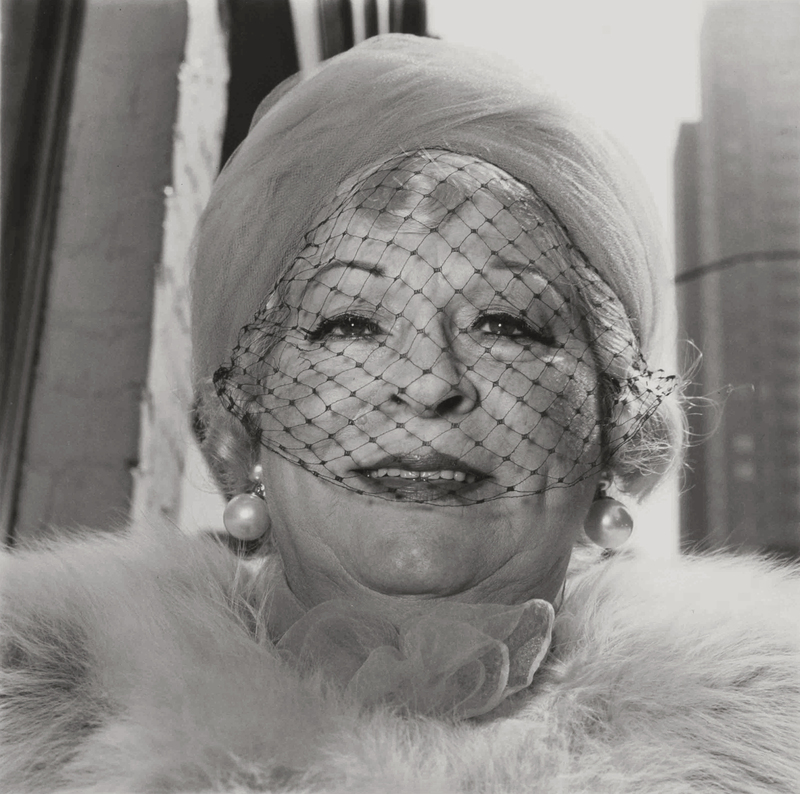 For Sarah Hermanson Meister, associate curator of the MoMA’s Department of Photography, “Portraits of New York amply reflects the history of synergies of this medium and of the Big Apple during a period of important transformations for both. 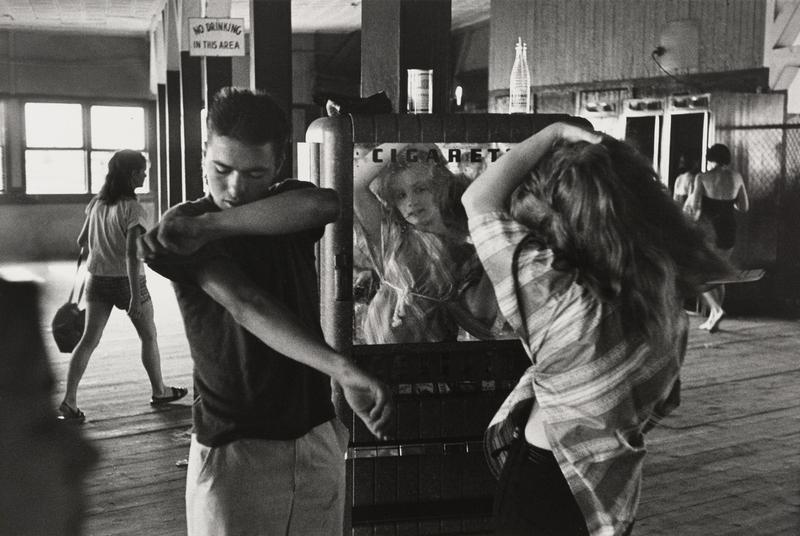 The photographs generated by the restless and constant commitment of numerous photographers to the city of New York have played a fundamental role in determining how New Yorkers perceive the city and themselves. 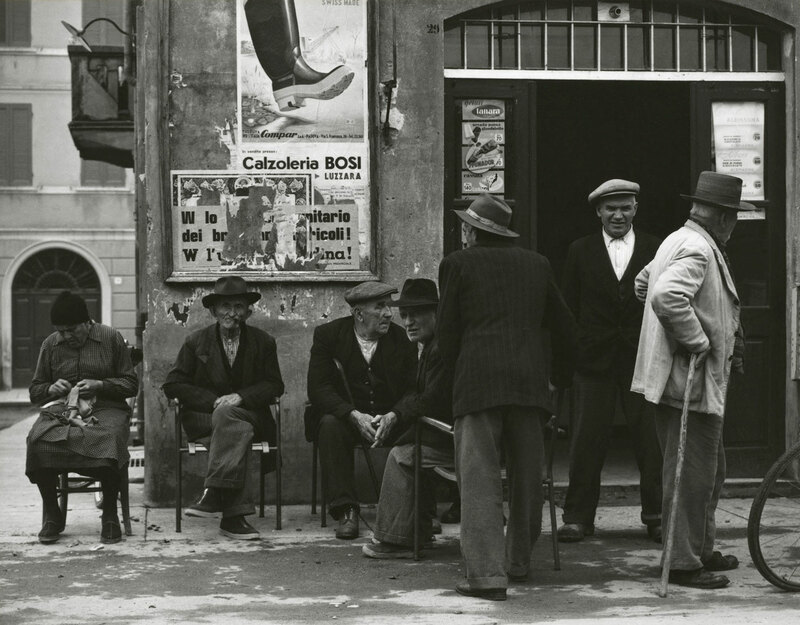 These photographs have also defined the city’s image in the world’s imagination. The exhibition curator continues: “Throughout the 20th century, numerous artists have felt inspired by New York’s combination of glamour and rawness. The city – which acquired its modernity at the same pace as photography, and in an equally impetuous and undisciplined way – has always been a theme of particular vitality for photographers, both those who have visited the city and those who live in it. On one occasion, faced with the challenge of capturing the essence of New York with a camera, the photographer Berenice Abbott wondered, “How shall the two-dimensional print in black and white suggest the flux of activity of the metropolis, the interaction of human beings and solid architectural constructions, all impinging upon each other in time?” Each of the photographs reproduced here is a unique response to that question. Each of Sherman’s sixty-nine Untitled Film Stills (1977-80), presents a female heroine from a movie we feel we must have seen. Here, she is the pert young career girl in a trim new suit on her first day in the big city. Among the others are the luscious librarian (#13), the chic starlet at her seaside hideaway (#7), the ingenue setting out on life’s journey (#48), and the tough but vulnerable film noir idol (#54). To make the pictures, Sherman herself played all of the roles or, more precisely, played all of the actresses playing all of the roles. In other words, the series is a fiction about a fiction, a deft encapsulation of the image of femininity that, through the movies, took hold of the collective imagination in postwar America – the period of Sherman’s youth, and the crucible of our contemporary culture. In fact, only a handful of the Untitled Film Stills are modelled directly on particular roles in actual movies, let alone on individual stills of the sort that the studios distribute to publicise their films. All the others are inventive allusions to generic types, and so our sure sense of recognition is all the more telling. It tells us that, knowingly or not, we have absorbed the movie culture that Sherman invites us to examine as a powerful force in our lives.